It is also possible to shorten the trail by a mile by picking it up at the Campground (as I did). 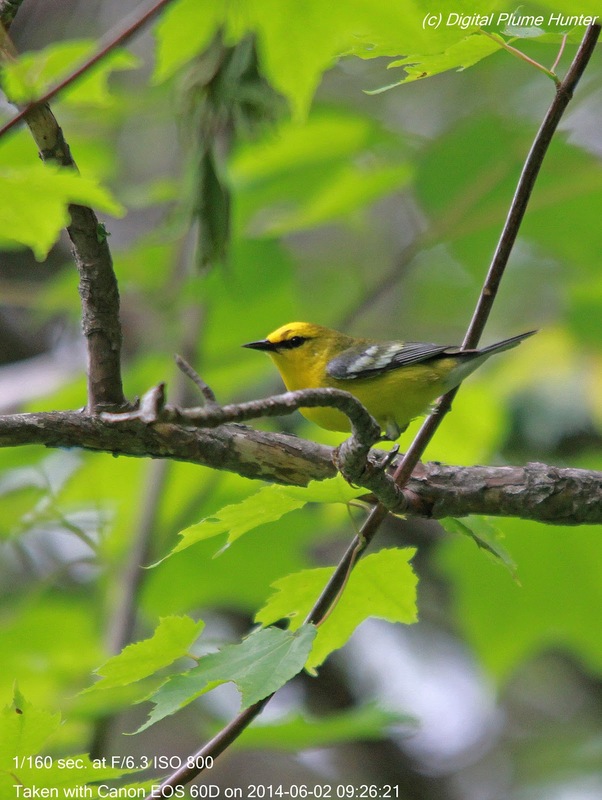 At the start of the trail some familiar species were seen, but the prize was found near the end of the trail -- where the Window Trail forks with the Oak Spring trail: Black-capped Vireo. 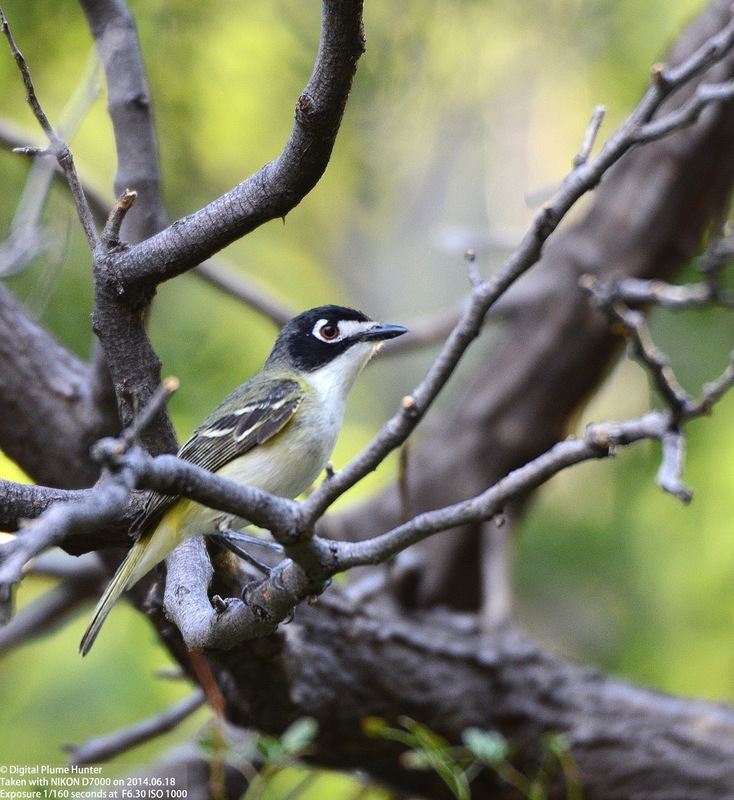 Although the Black-capped Vireo is listed as "Endangered" by the US Fish and Wildlife Service, on a global basis, the IUCN has it listed one notch above -- at "Vulnerable". 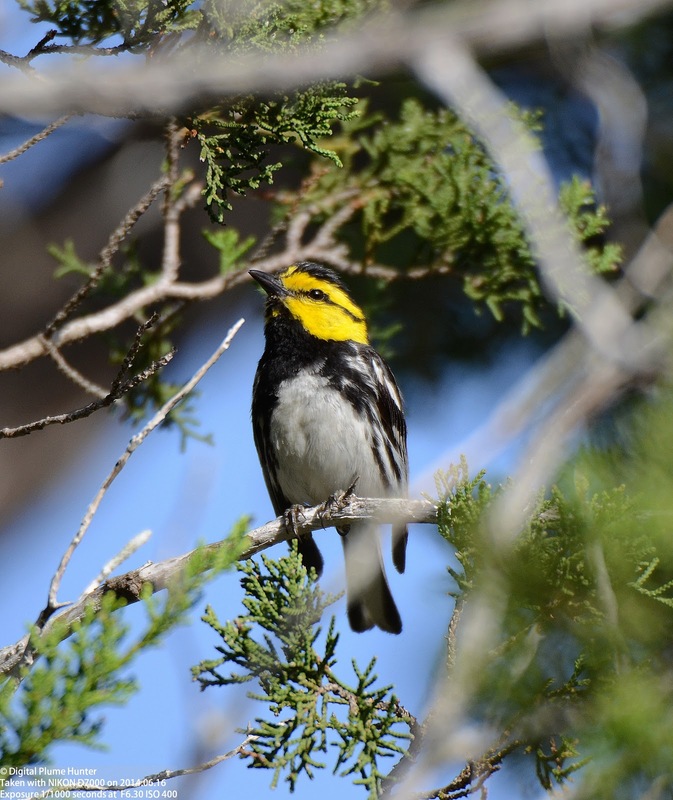 Unfortunately, it is no longer found in its historical range in the US (which included Kansas) and is now found only in the Edwards Plateau region in Texas and just 3 counties in Oklahoma. 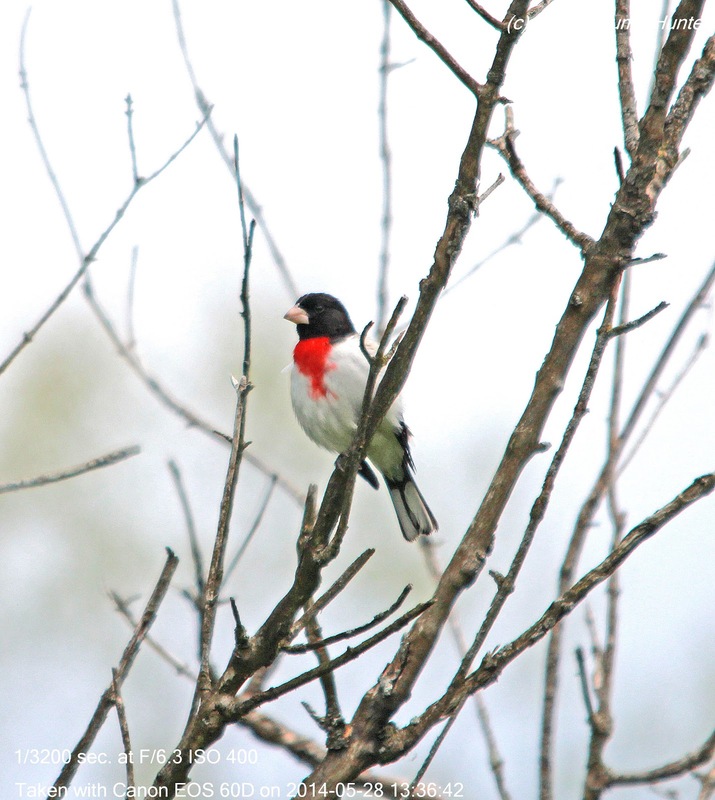 Brood parasitism and habitat loss are the chief culprits in its population decline. 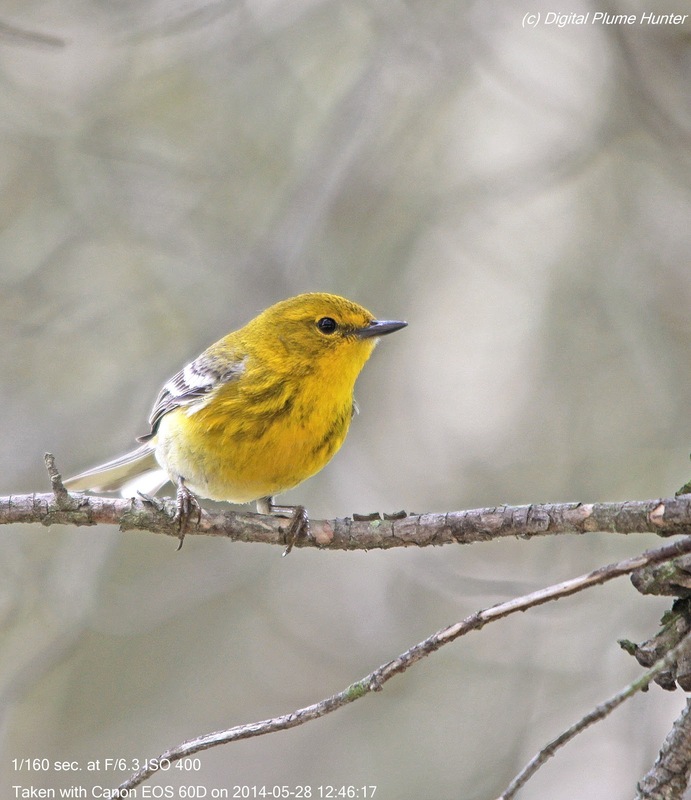 Sadly, the total global count of this handsome vireo is estimated to be no more than 5,3000 mature individuals. 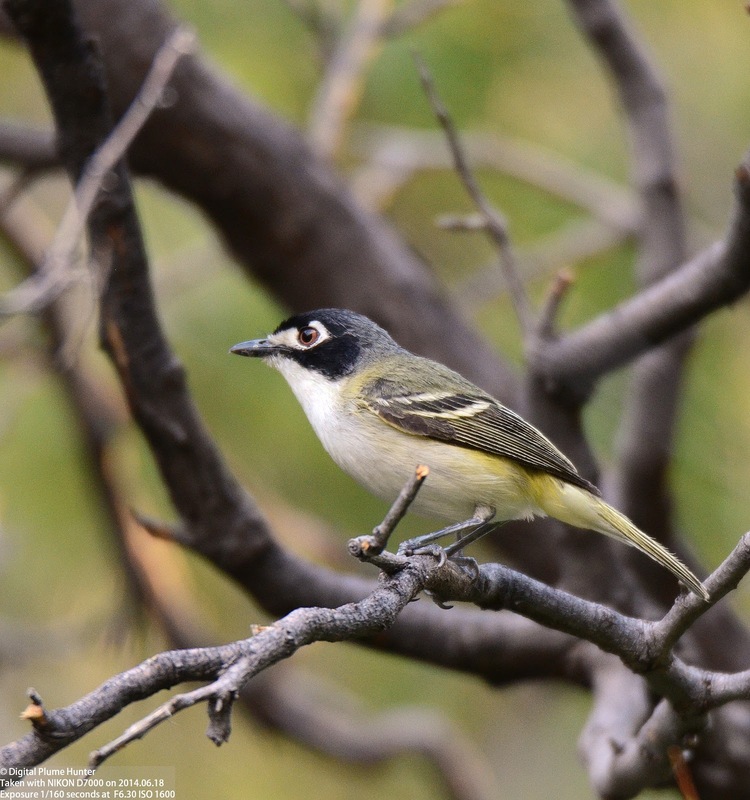 Black-capped Vireo is our smallest vireo and visually also our most distinctive. 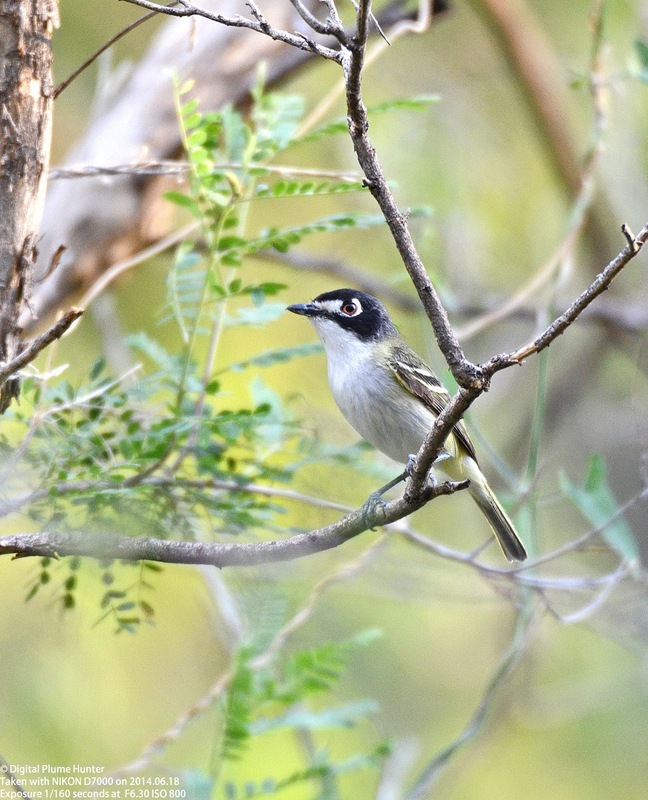 Like many vireos, it shows olive and green on its upper parts while the undersides are white. 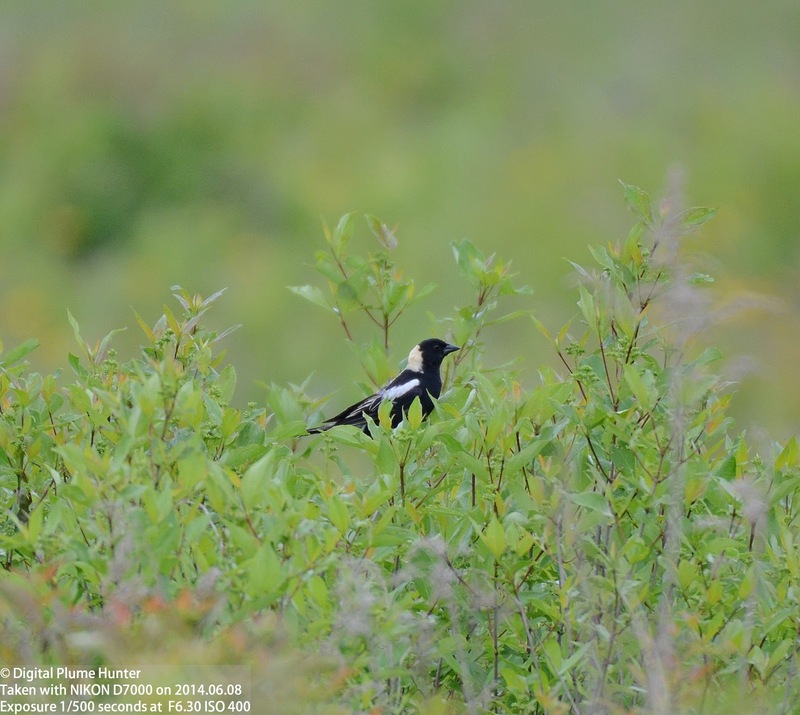 The crown and face are black; the latter contrasting strongly with its prominent white spectacles. 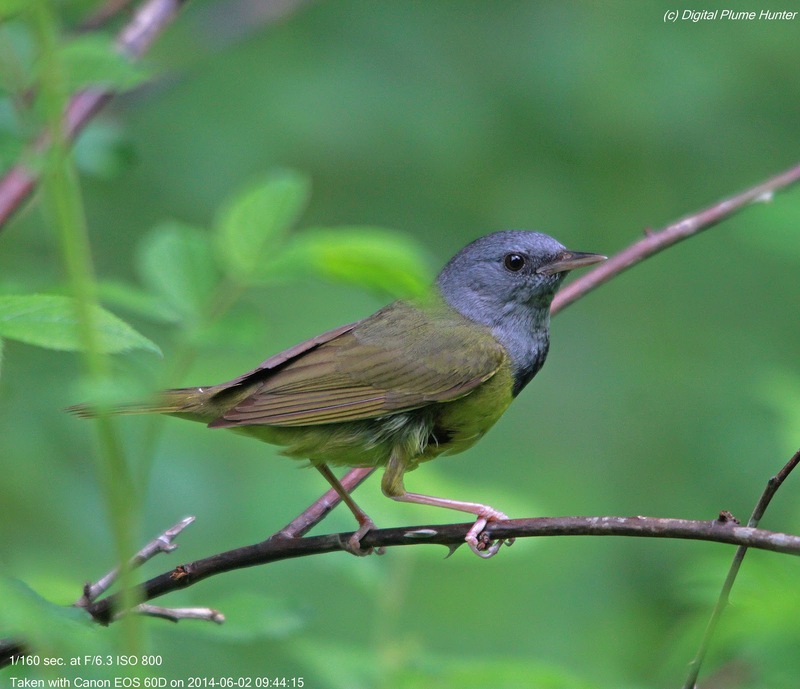 It is the only vireo that is sexually dimorphic with females substituting grey for the male's bold black. 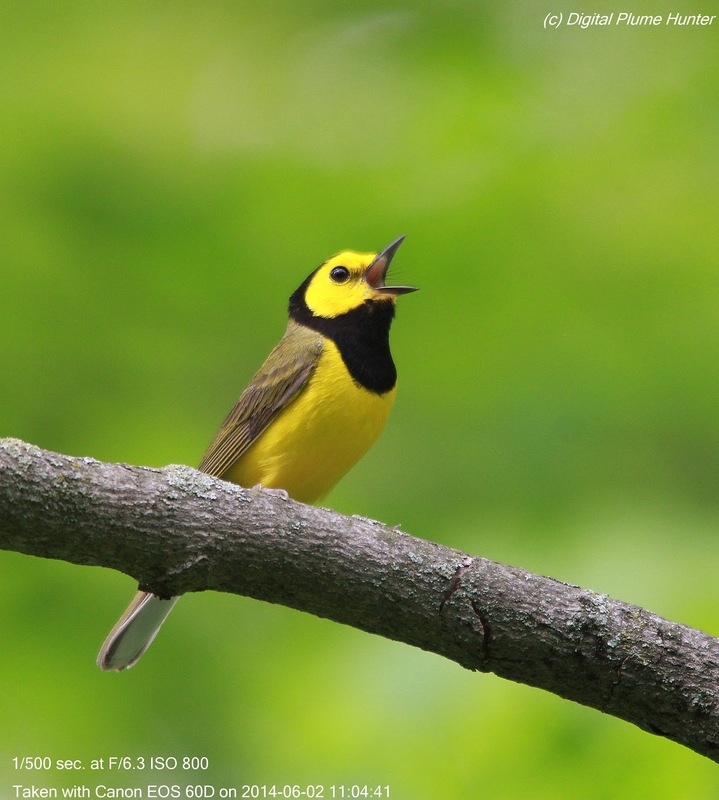 Like other Orioles, Scott's too has a sweet and fluty song. 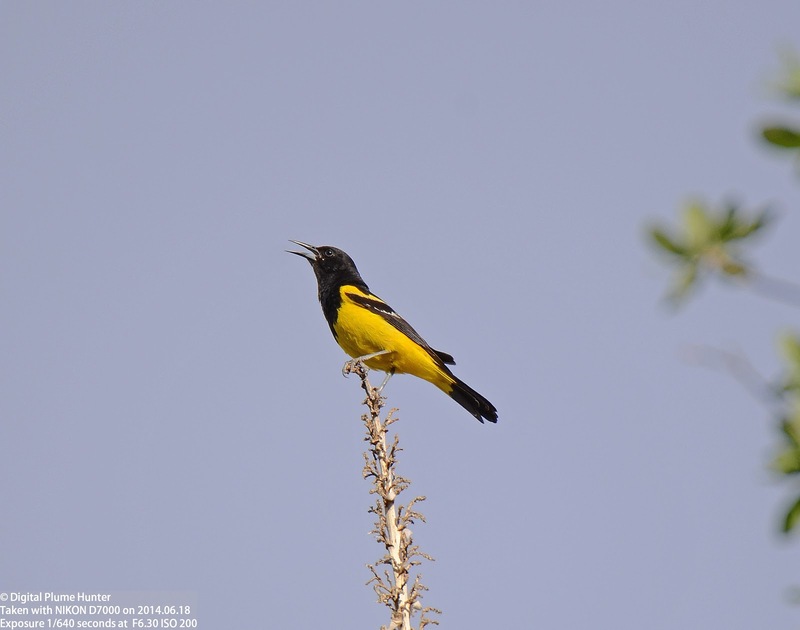 This lemon-yellow and black Icterid is found only in the Southwest US. 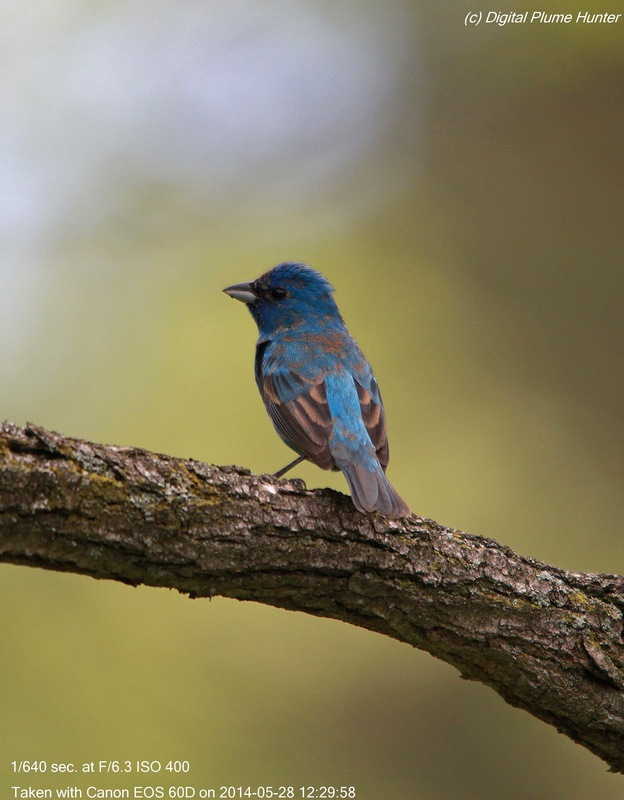 In addition to these remarkable species, more familiar ones were observed: Indigo Bunting and Blue Grosbeak. 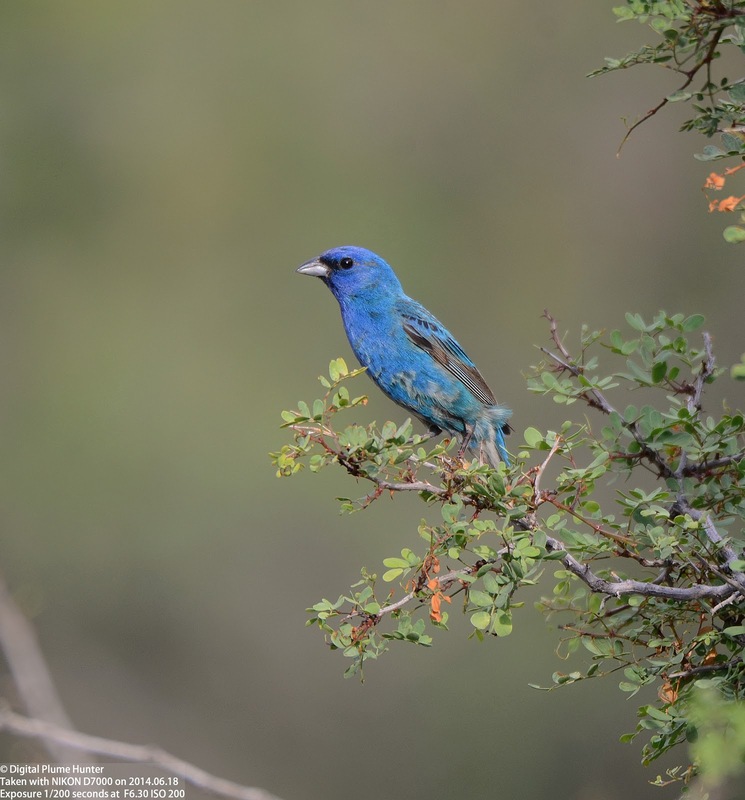 The Indigo Bunting was the 3rd Bunting spied at Big Bend -- the others being Painted and Varied Buntings. 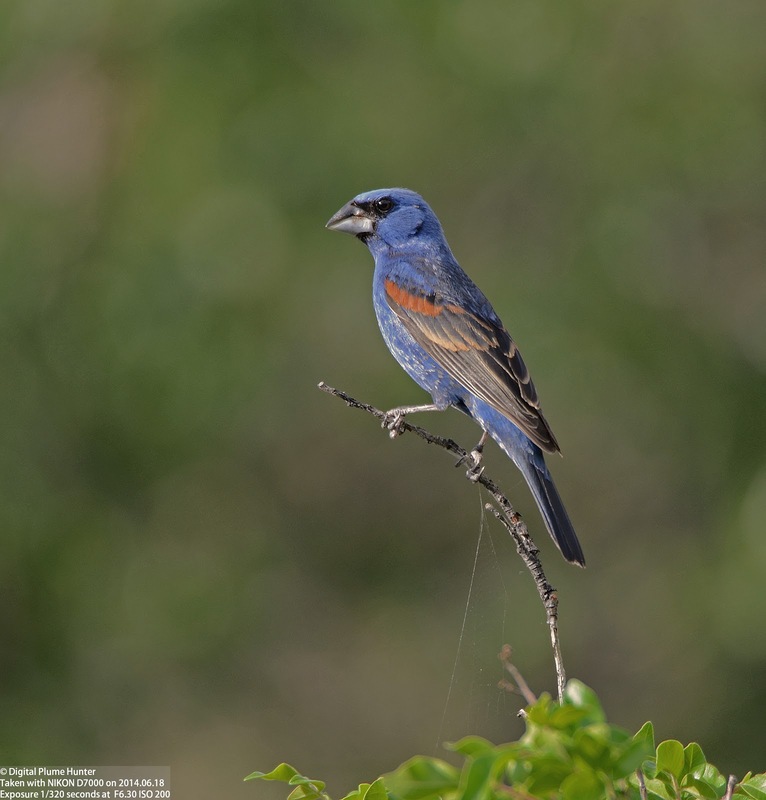 Blue Grosbeak is a widespread species at Big Bend -- looking like a bigger brother to the Indigo; however, the brown wingbars, darker blue coloration and stouter bill distinguish it readily from the smaller Bunting. 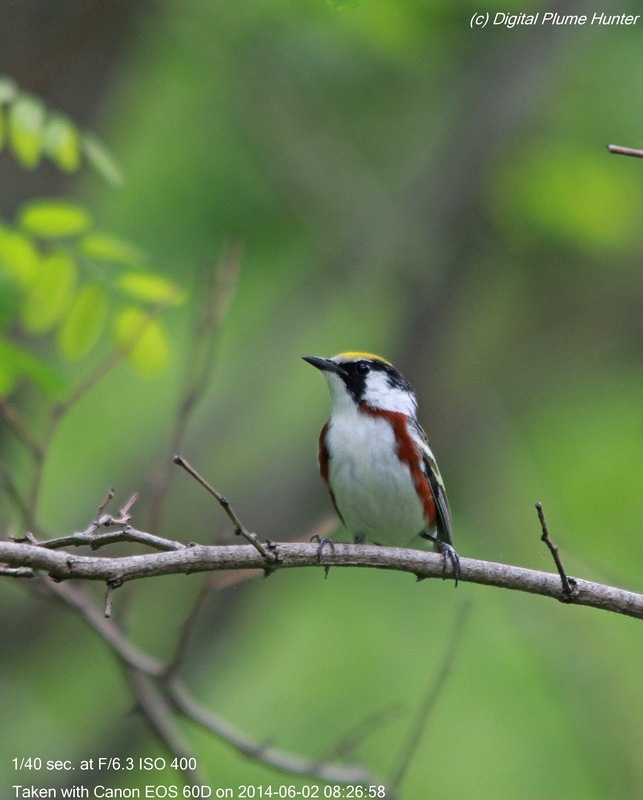 Of our 13 vireo species, no species captures the imagination more so than the Black-capped Vireo. 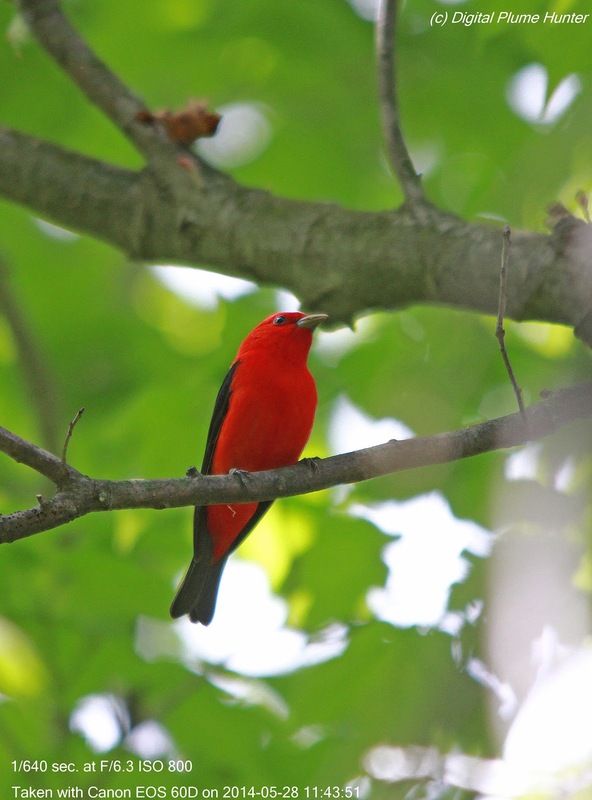 Although smallest in size, it exceeds its kindred species in every other dimension -- be it in song, color or rarity. 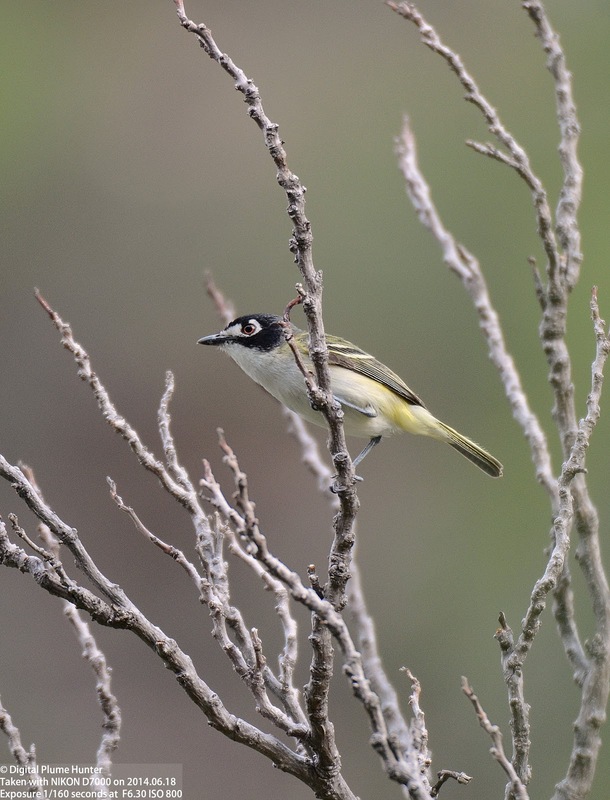 And, while Big Bend affords many an avian treasure, the uniqueness of the little Black-capped Vireo remains in a league of its own. 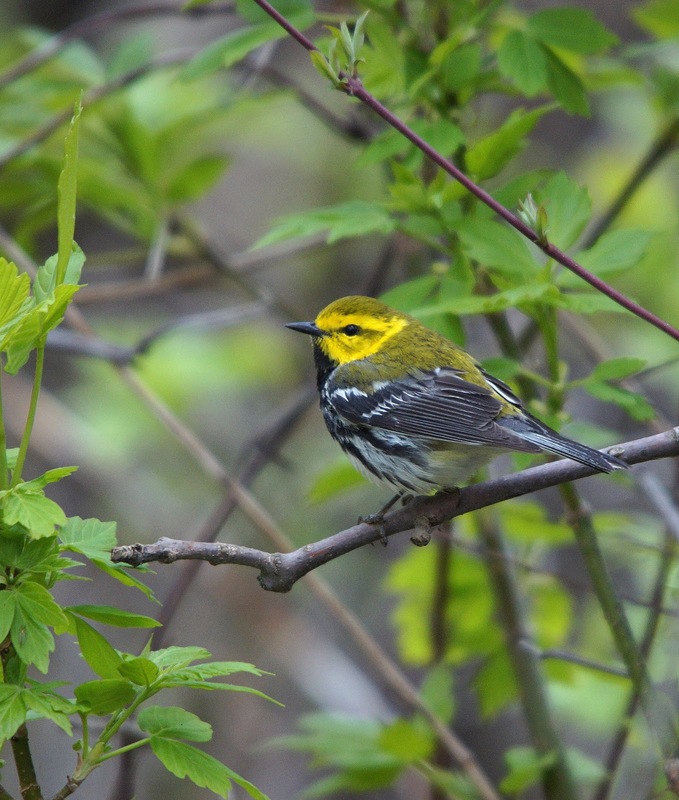 Of our 54 warbler species, there is but one North American wood warbler that is classified as "Endangered": the Golden-cheeked Warbler. 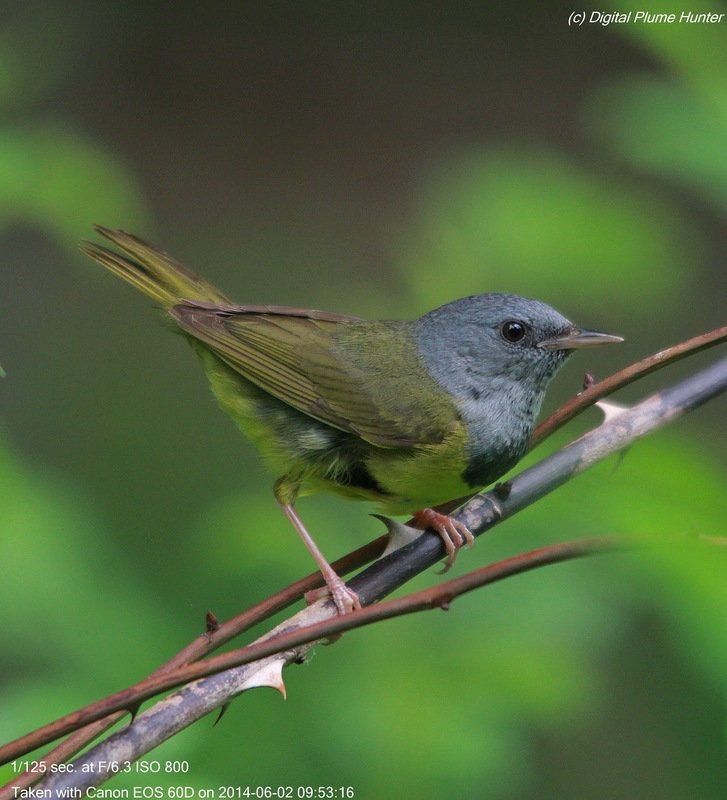 Only Bachman's Warbler which is listed as "Critical/Possibly Extinct" is listed at a higher degree of ecological risk (unfortunately, with no confirmed records since 1977, the worst is feared). 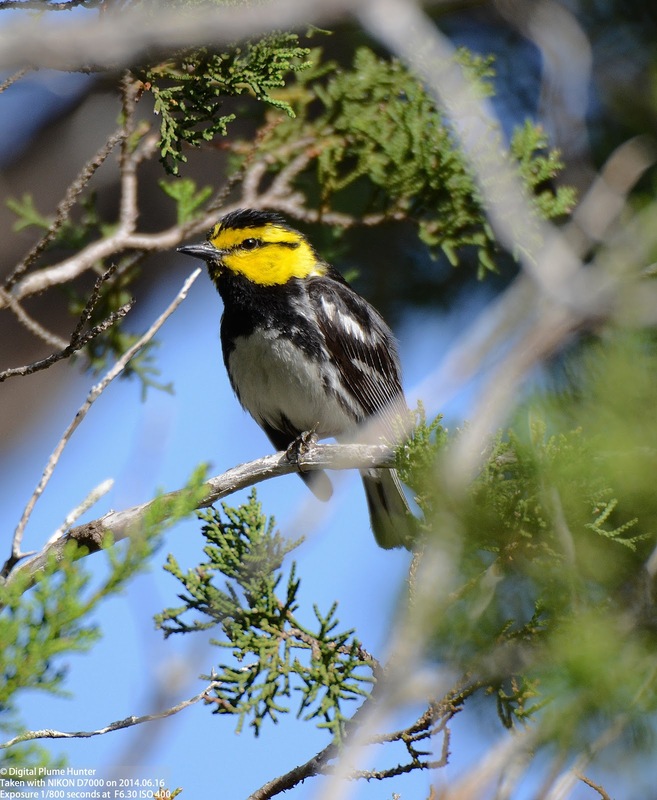 The Golden-cheeked Warbler is also the only avian species that nests exclusively in central Texas (the Edwards plateau region) and nowhere else in the world. 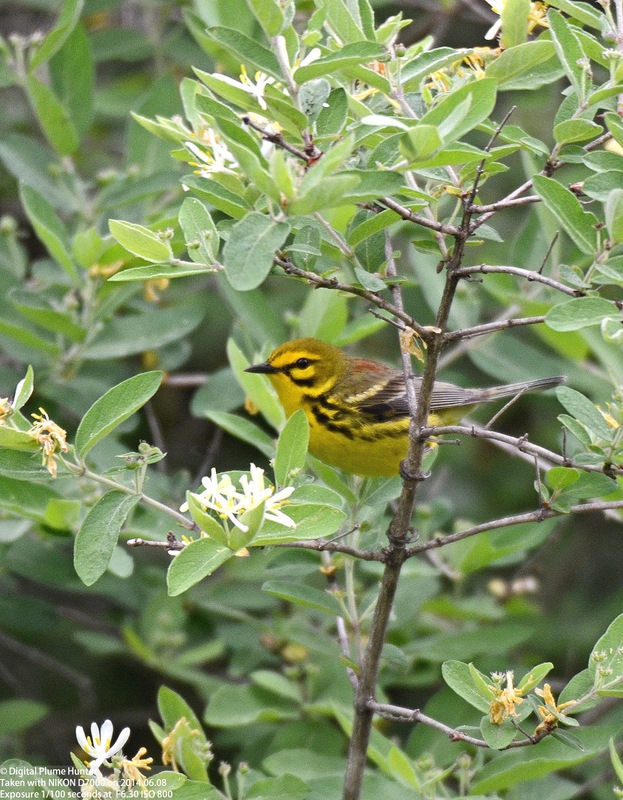 Therefore, to see this rare species in Summer, a trip to suitable juniper/oak habitat in Texas is required. 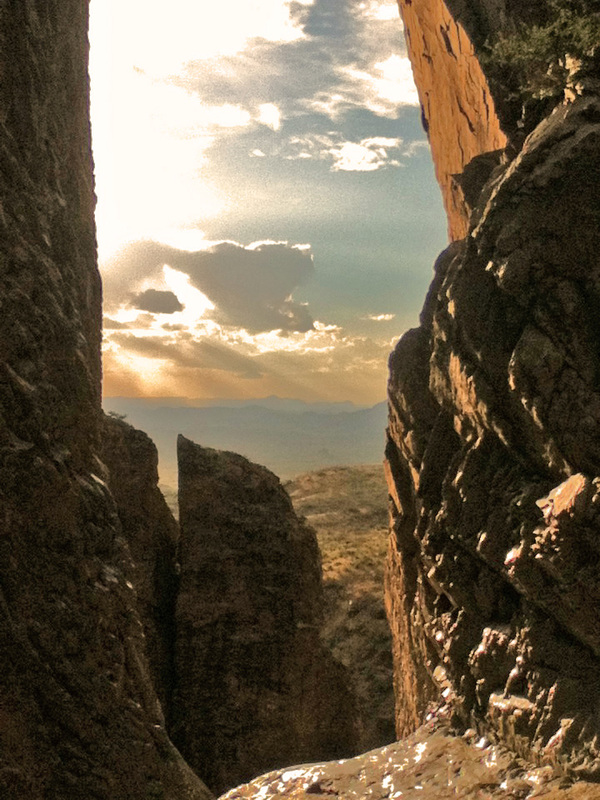 And, a small parcel of land that precisely fits this description is found in suburban San Antonio: Friedrich Wilderness Park. 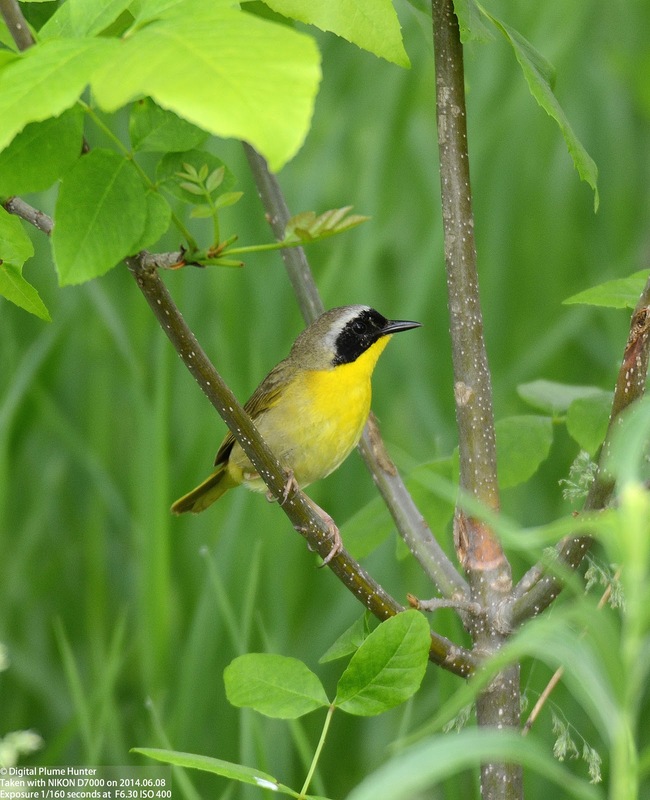 In this view both warblers show many similarities: white undersides, black throats, yellow face and an eye-stripe (they also both have black wings with 2 white wing-bars). 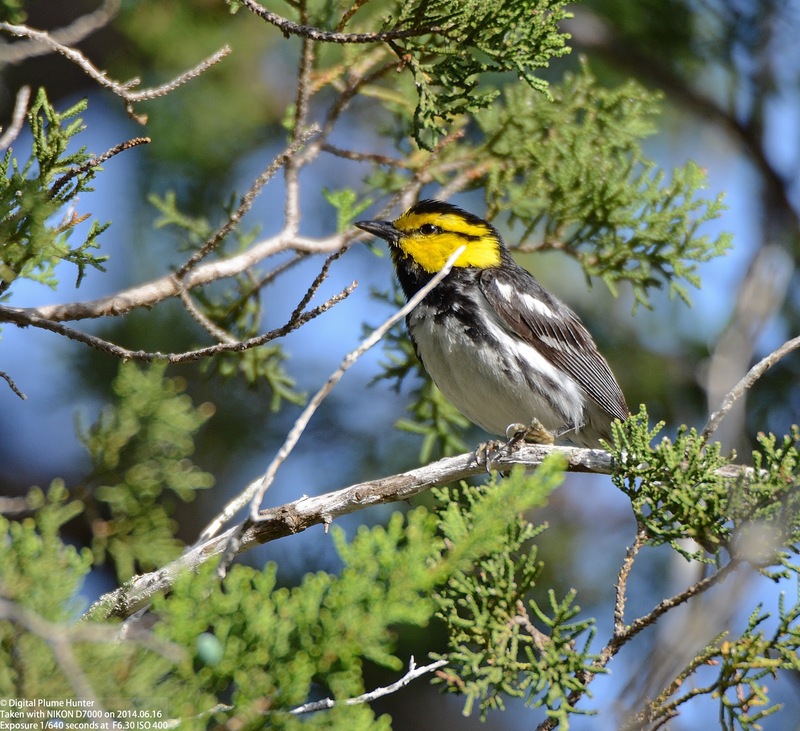 The primary reason for the decline in Golden-cheeked Warbler populations is habitat destruction in both its breeding grounds in Texas as well as its wintering sites in Central America. 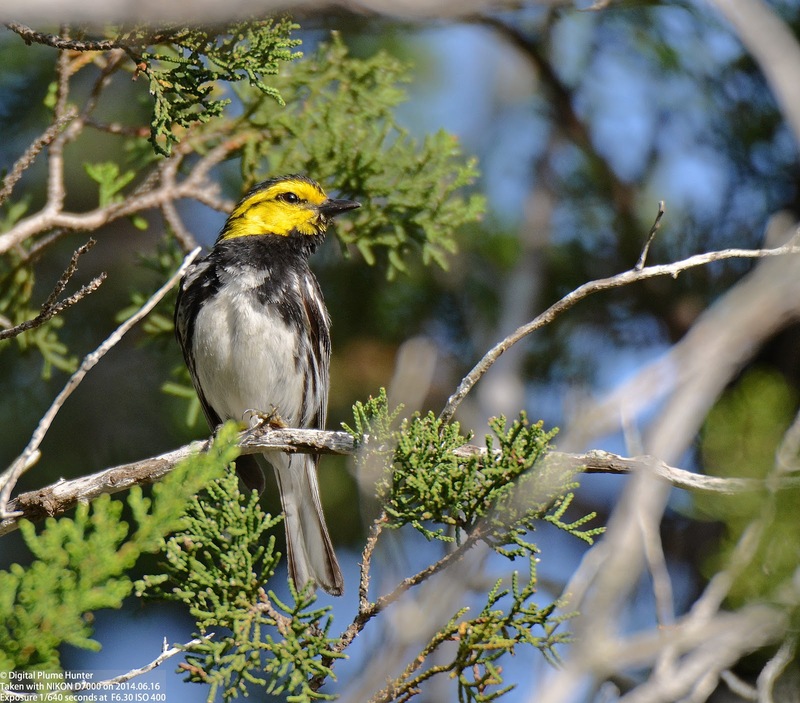 Golden-cheeked Warblers can be seen in Texas from March through August. 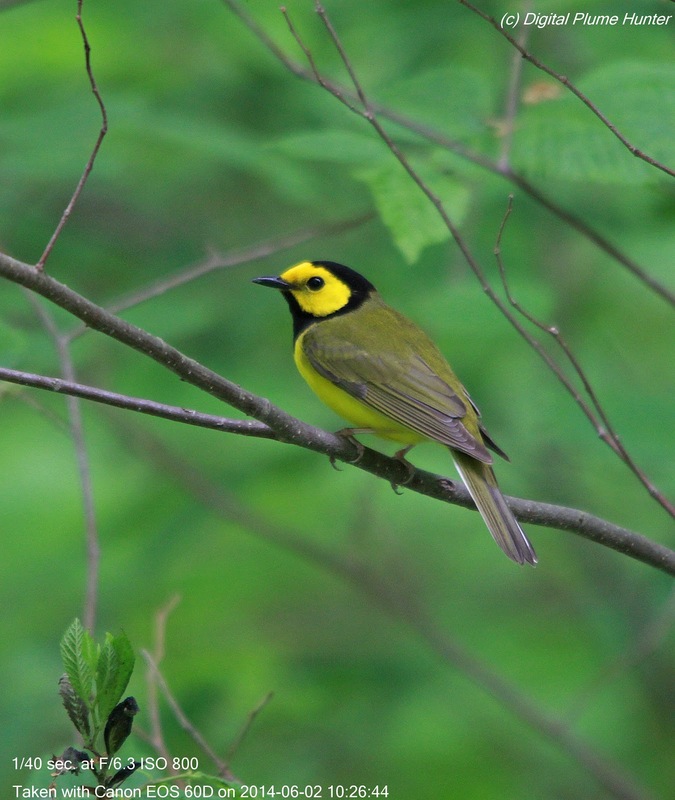 Males are much more conspicuous in the earlier part of their breeding season when the best way to find them is by listening for their buzzy song. 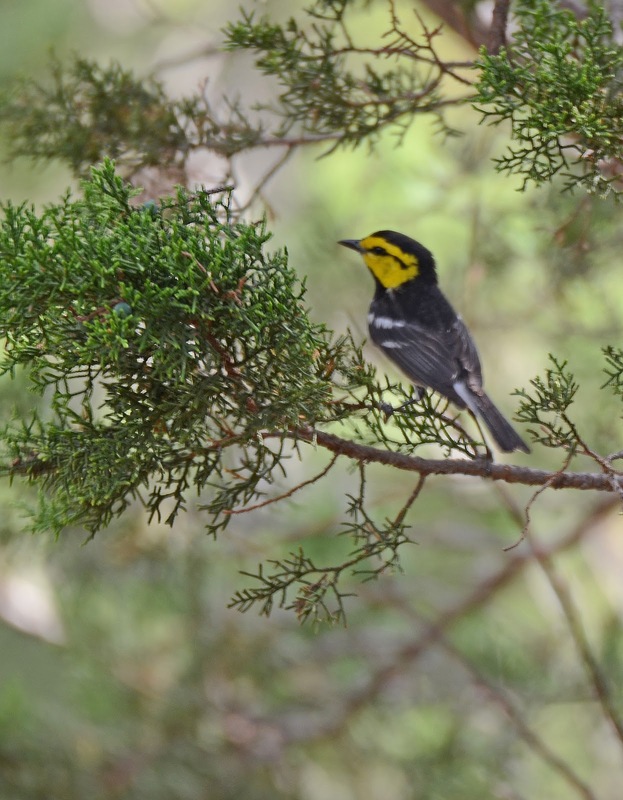 Given this warbler's strict requirements for nesting habitat (juniper/oak canyonlands), it is restricted to just 13 counties in the Edwards Plateau region of Texas. 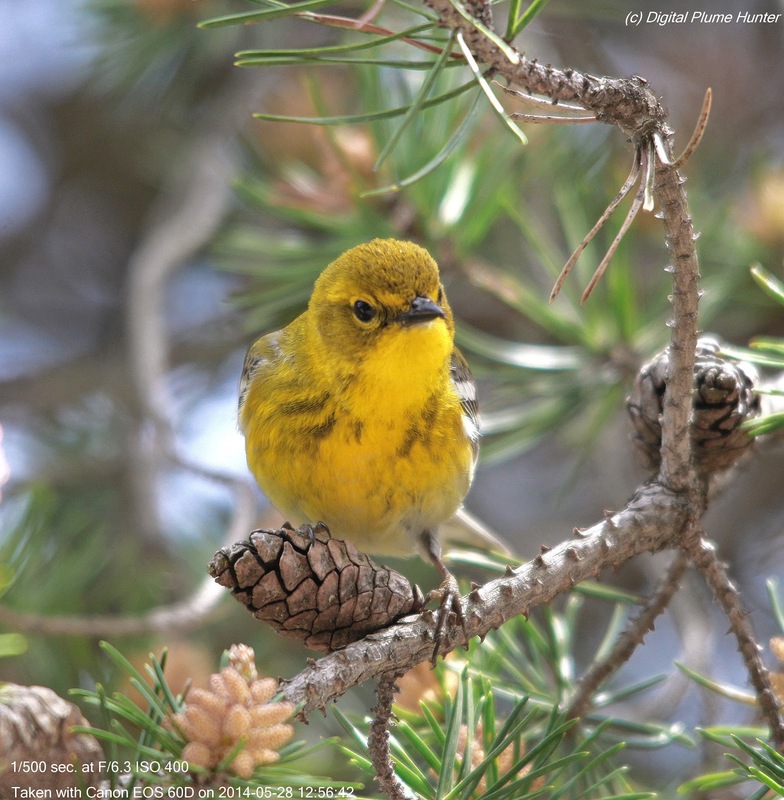 This theme is similar to Kirtland's Warbler which is also extremely fussy about young jack pine breeding habitat in Michigan. 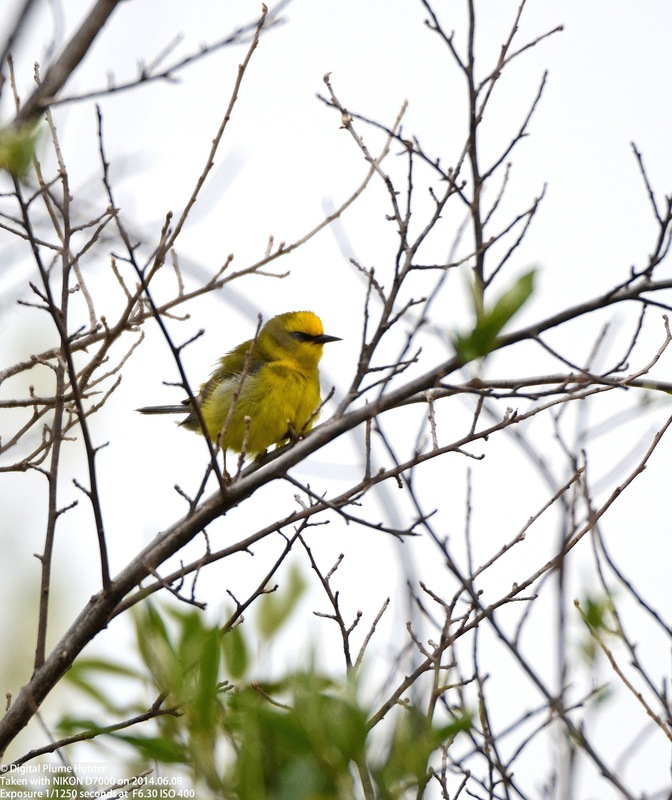 However, unlike Kirtland's which has known to have bred in Ontario and Wisconsin, the Golden-cheeked is a breeder exclusive to Texas. 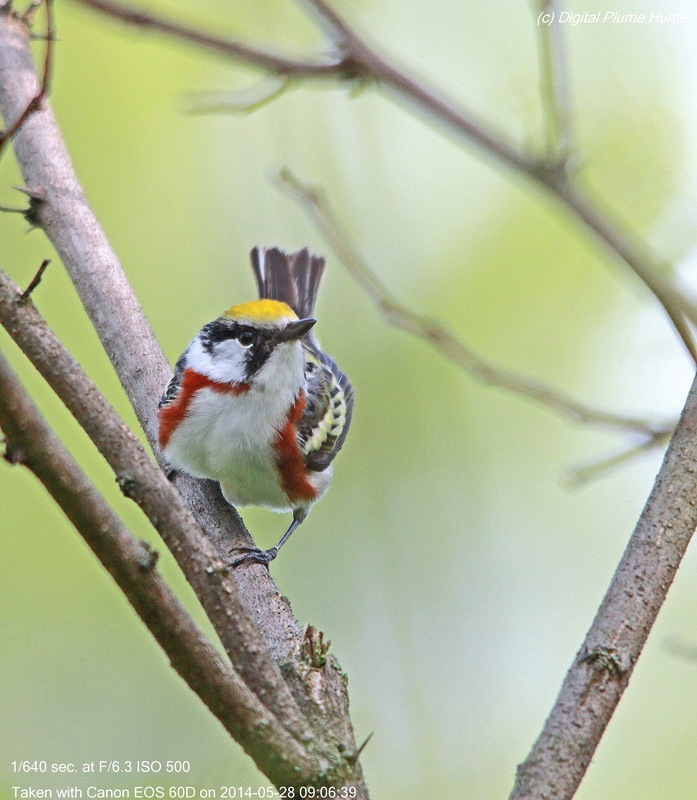 This exclusivity coupled with its endangered status make for a compelling argument to add the striking Golden-cheeked Warbler to your birding experience. 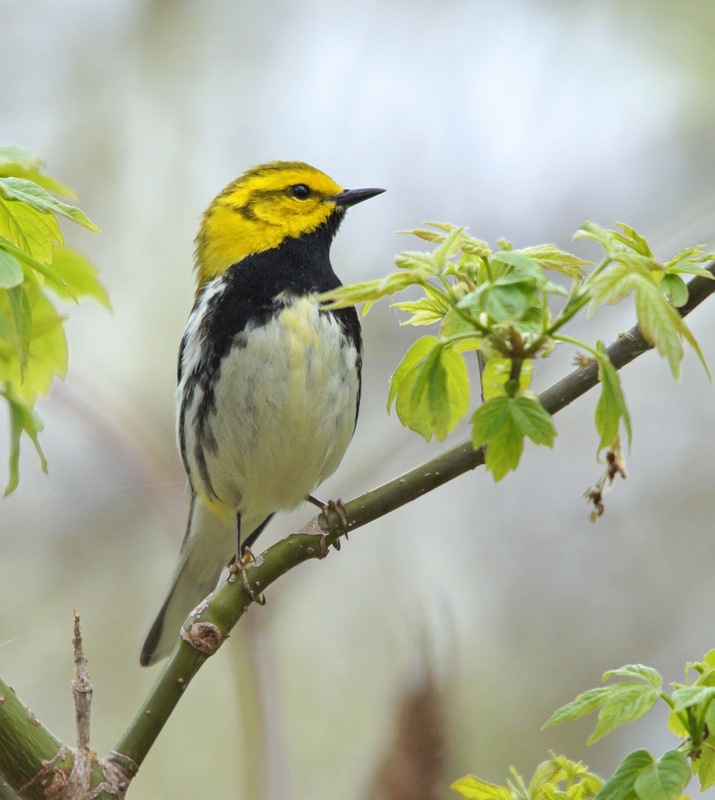 If you look at the range map for Prairie Warbler in Michigan, it will be clear that this attractive species may be found patchily in Summer along the Lake Michigan shoreline in Western Michigan. 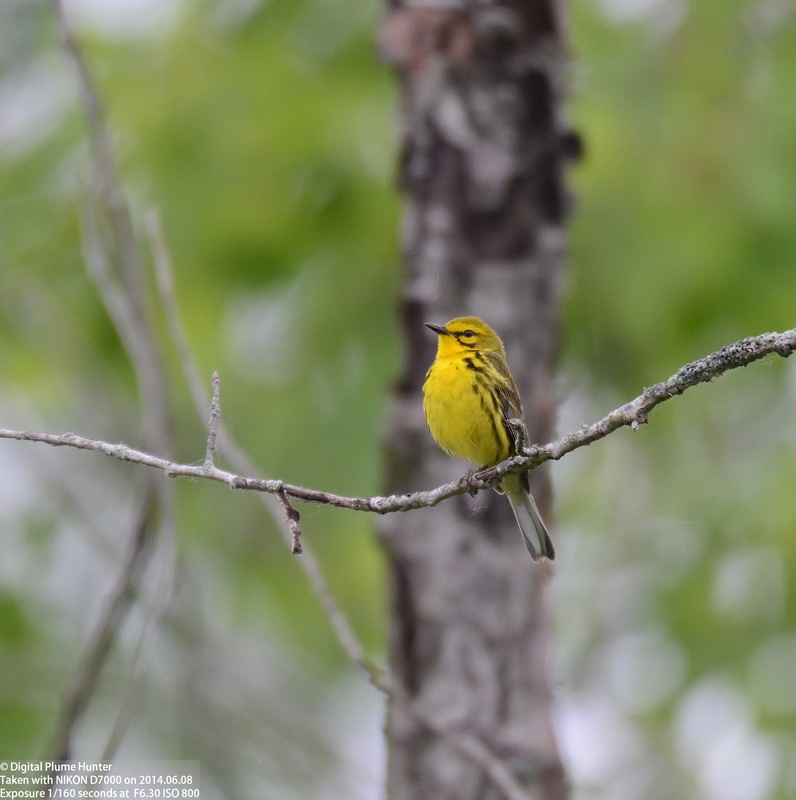 There are two subspecies of the Prairie Warbler found in the US -- a Northern race which is entirely migratory and a Southern (or Florida) race which is a permanent resident in the mangroves of South Florida. 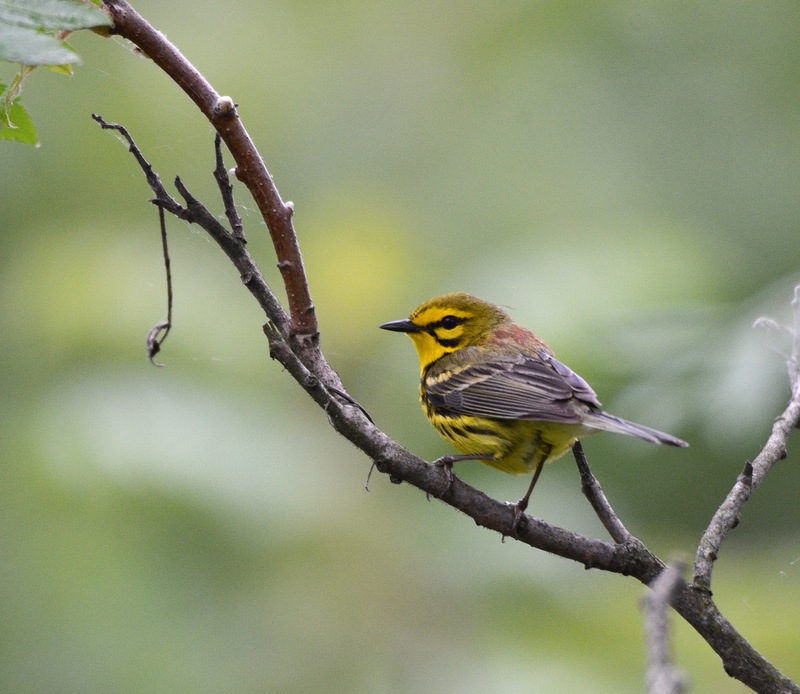 The population of the Prairie Warbler has contracted dramatically -- they are listed as a state endangered species in Michigan. 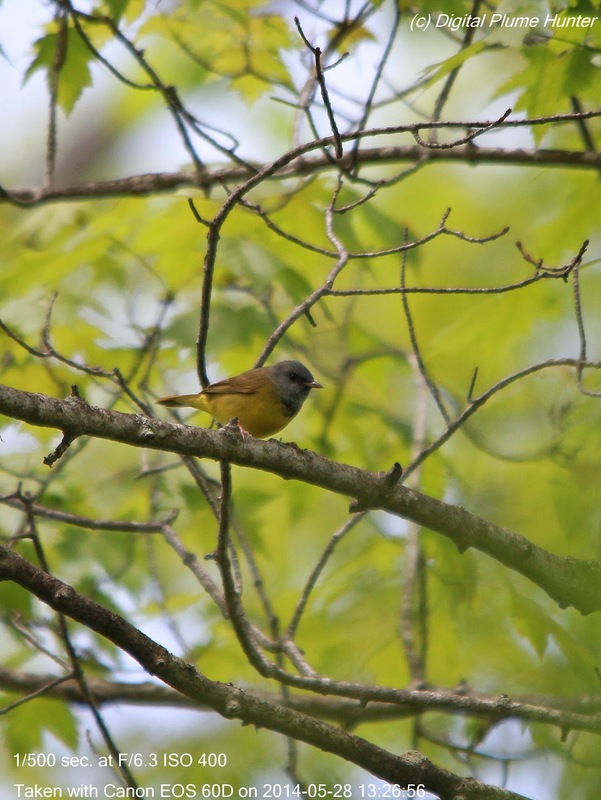 Loss of habitat and brood parasitism by the Brown-headed Cowbird are the leading causes. 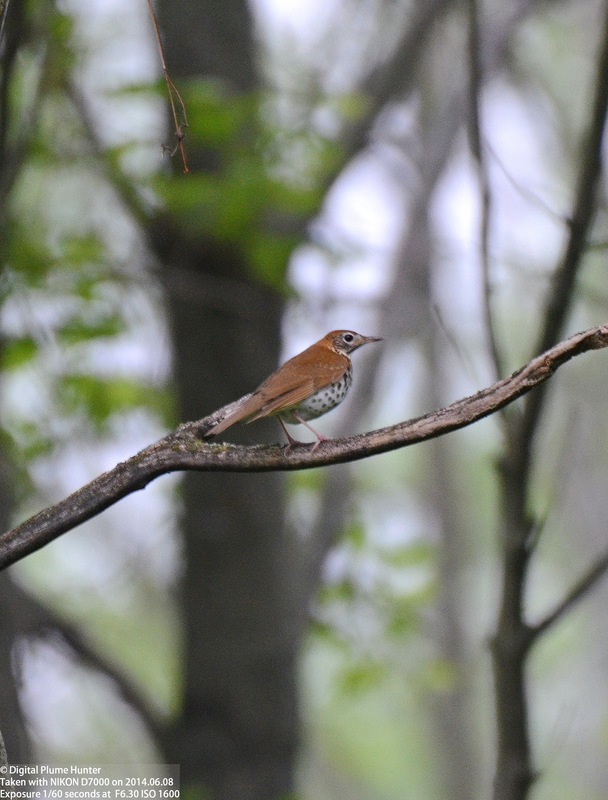 The Wood Thrush's song is made possible by a "Y" shaped voicebox that can generate two different notes simultaneously creating a mellifluous and unforgettable harmony. 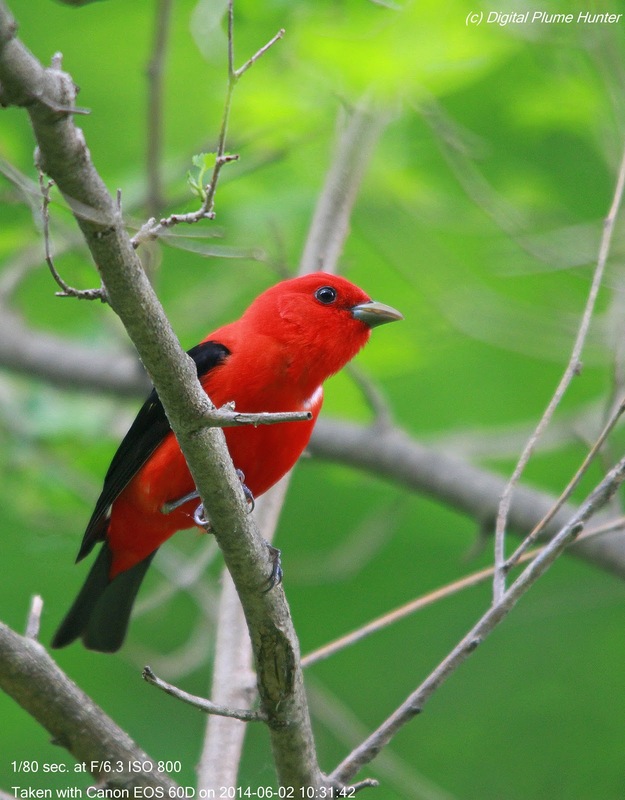 The species population has declined by over 50% since the 1960's. 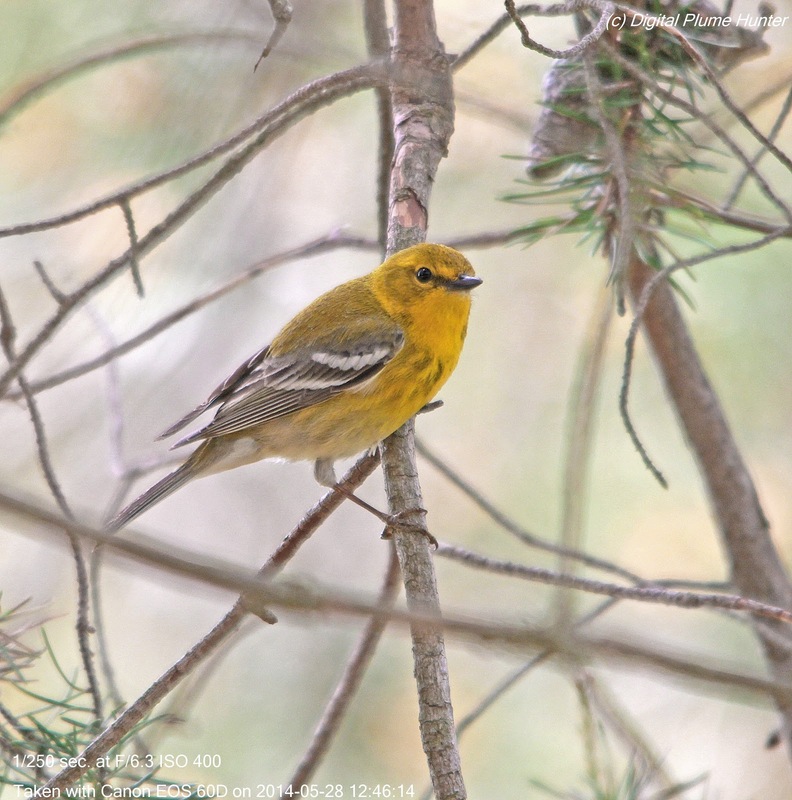 Wintering in Argentina, it is small wonder that covering all that distance to North America (breeding as far North as Canada), takes till early Summer. 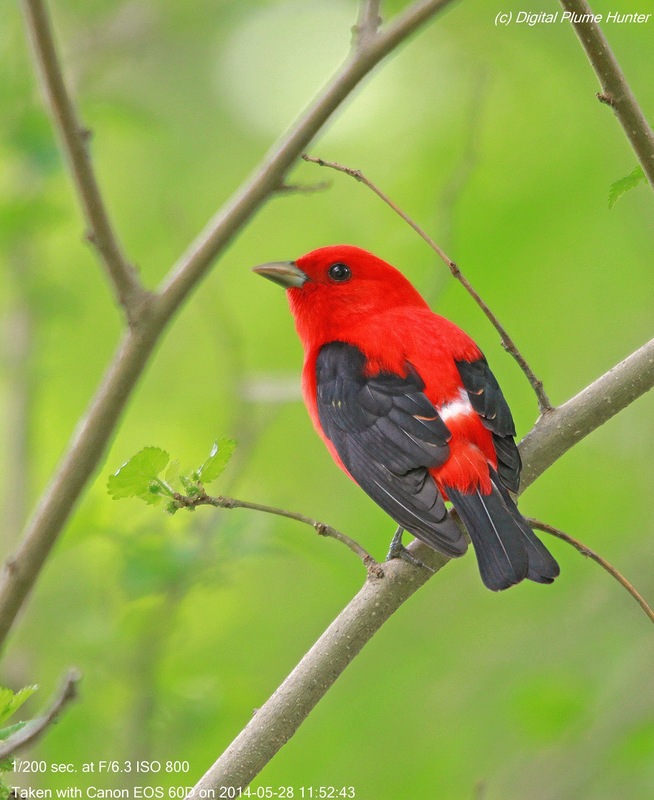 This iconic blackbird is a rapidly declining species of grasslands even though its global population is 8 million. 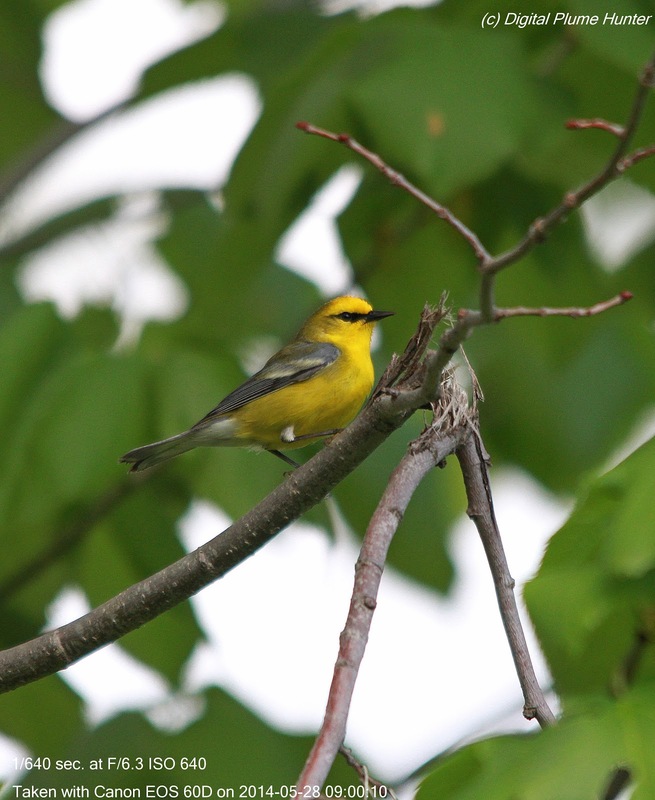 Breeding ranges are dynamic -- for example, just a few years ago, Golden-winged Warbler was a regular breeder at Port Huron SGA. 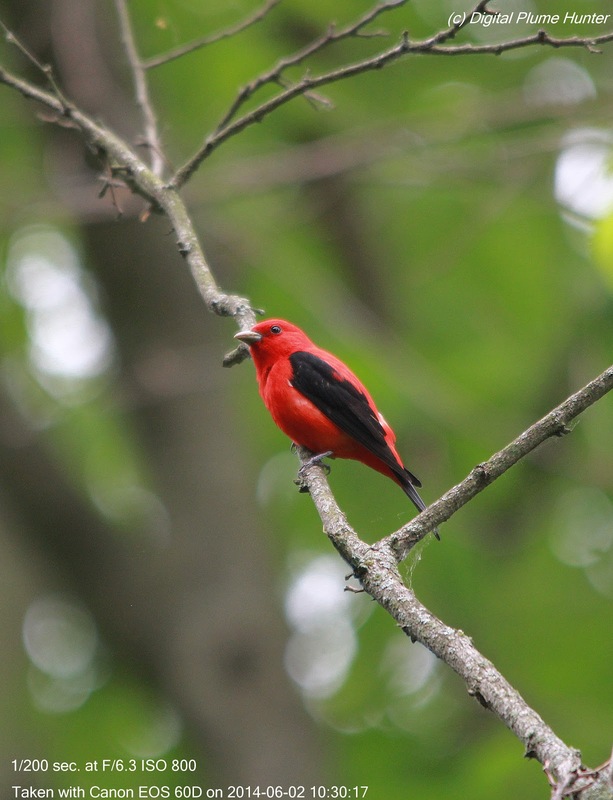 Sadly, they are no longer found in SE Michigan. 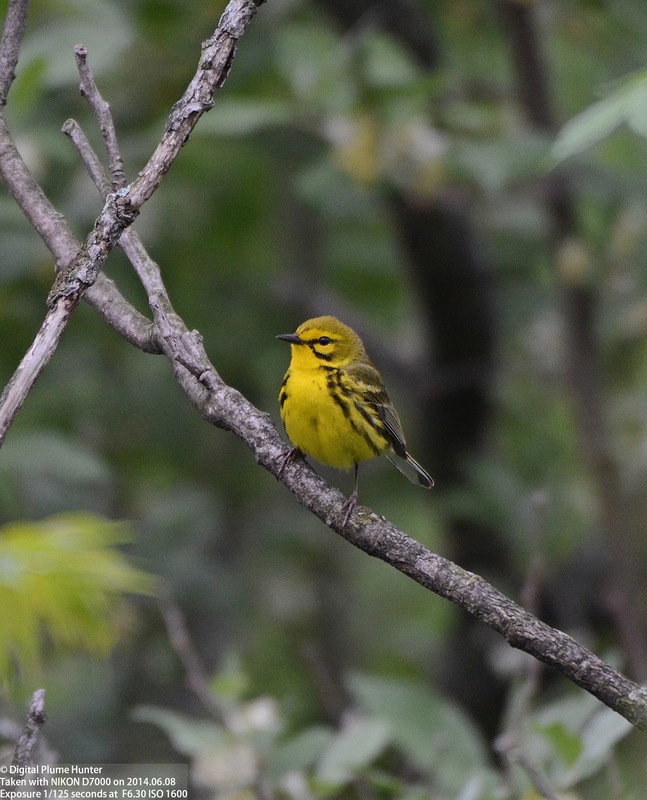 Thus, it is a tremendous opportunity when an irregular breeder in these parts, such as the handsome Prairie Warbler, graces the forest with its unmistakable song and bright charisma. 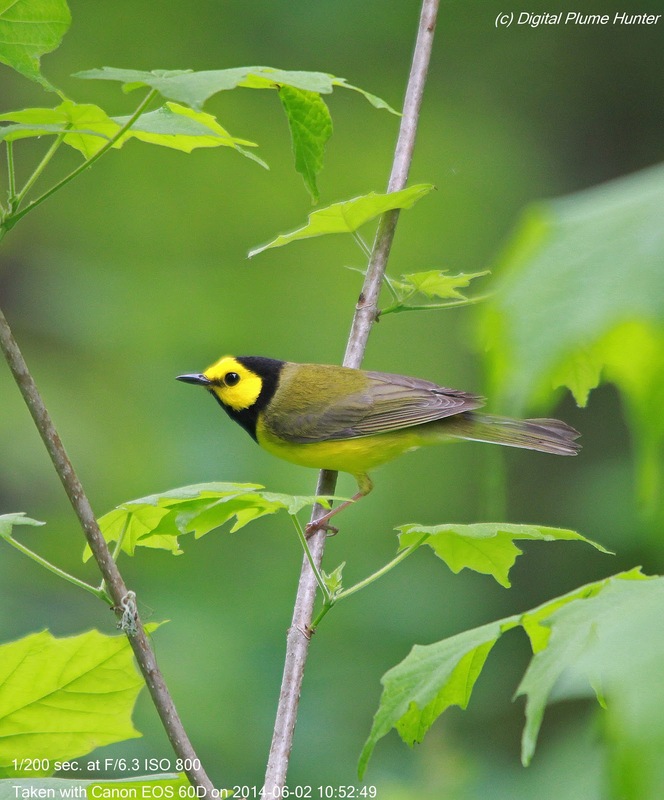 Two irresistibly charismatic warblers highlight this post: Mourning Warbler and Hooded Warbler. 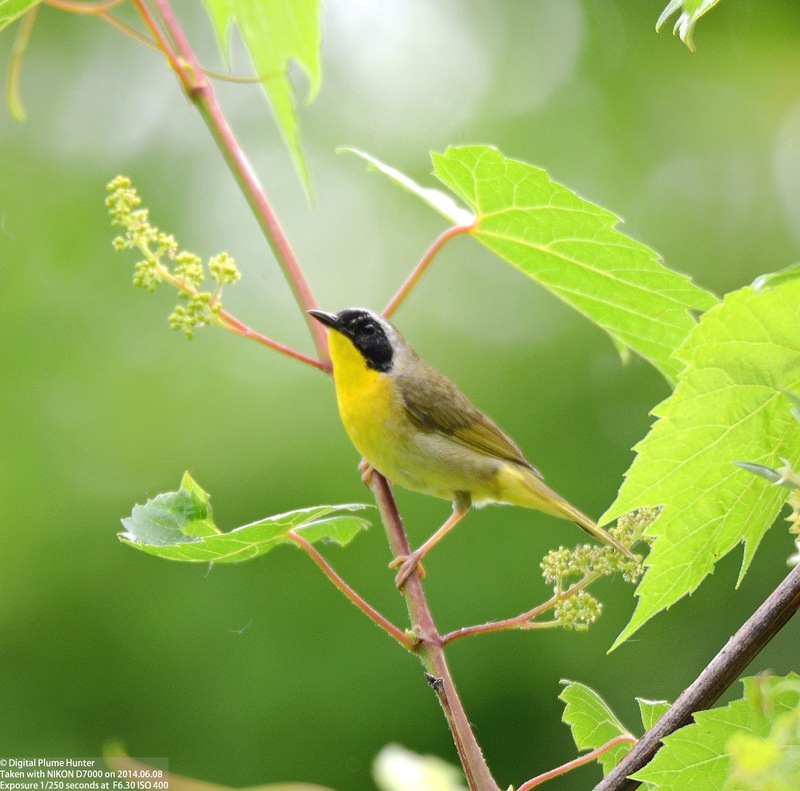 Both warblers are visually striking and vocally distinctive -- and, both can be found on the Abbotsford Road trail at Port Huron State Game Area when the males are on territory in early Summer. 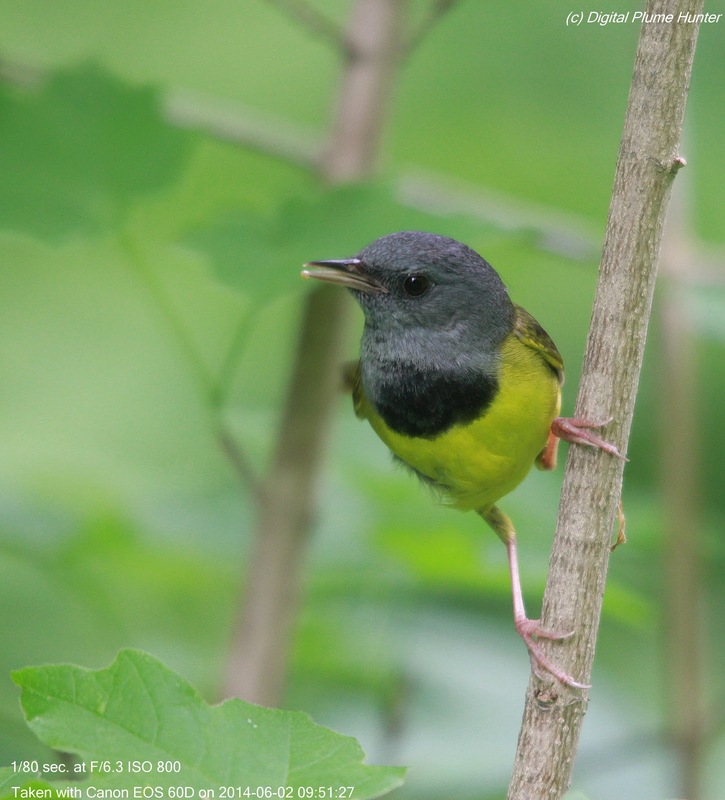 Mourning Warbler's identification characteristics include a steel-grey hood, black bib, yellow undersides and an olive back. 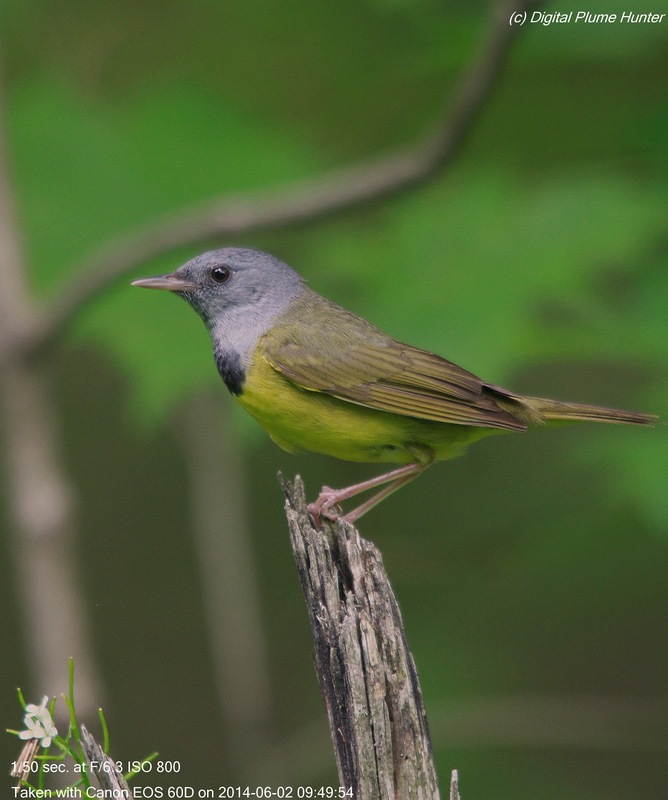 It lacks (complete or broken) eye rings -- a fact that helps distinguish it from the otherwise similar MacGillivray's and Connecticut Warbler. 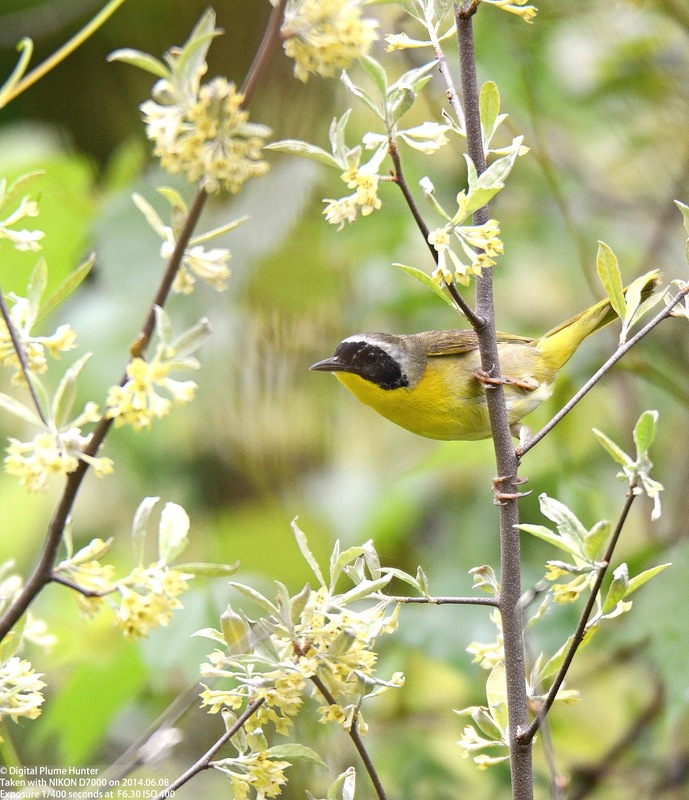 Although locally common in its breeding range, the Mourning Warbler is nonetheless a difficult warbler to observe. 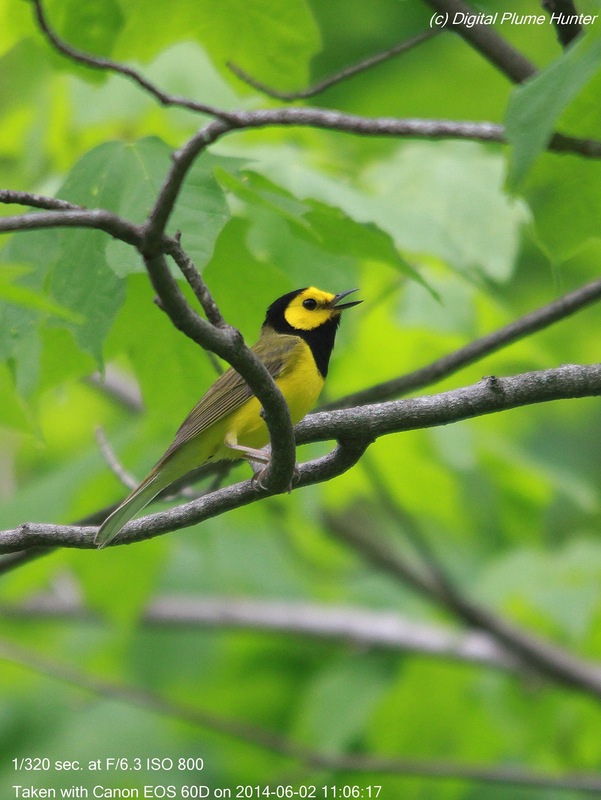 It tends to stay low in the underbrush but its song is loud and betrays its presence. 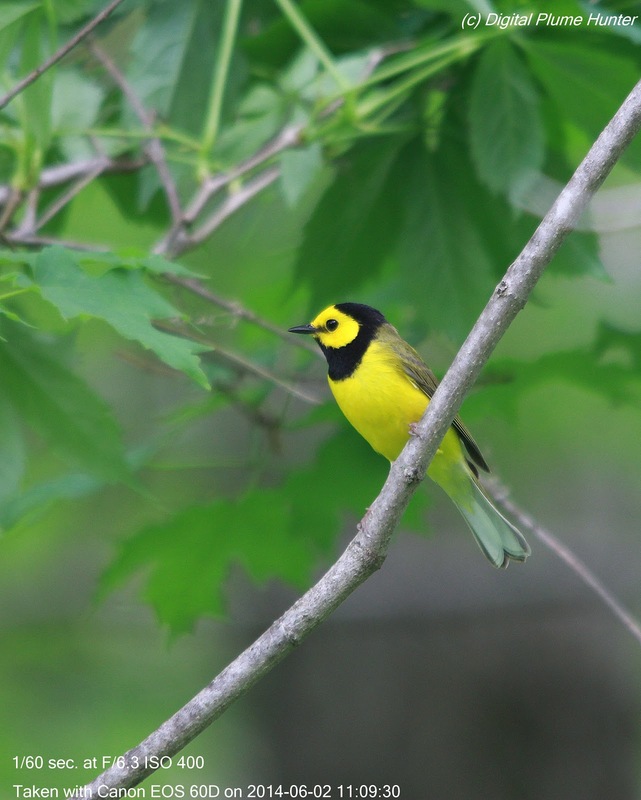 The Hooded Warbler looks like a lemon-yellow bird wearing a black balaclava! 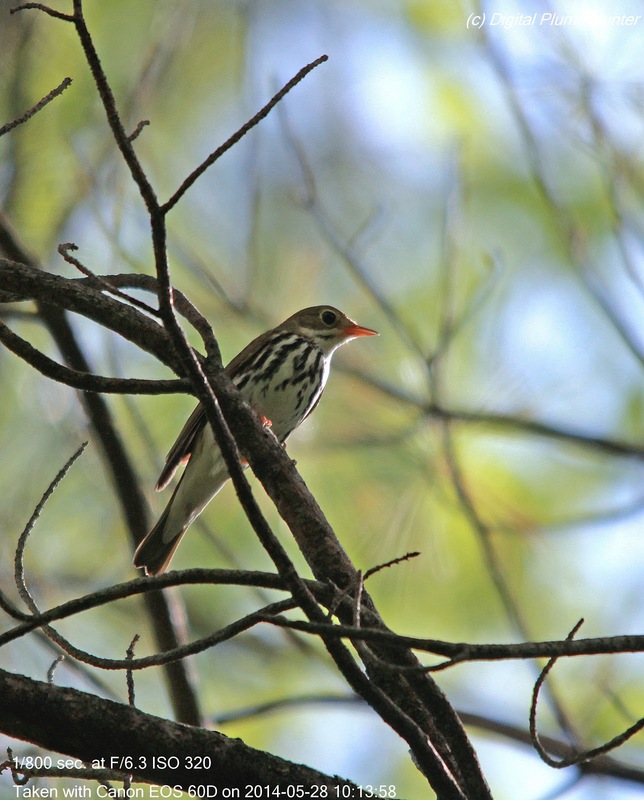 Like the Mourning Warbler, the legs are pink and the back is olive. 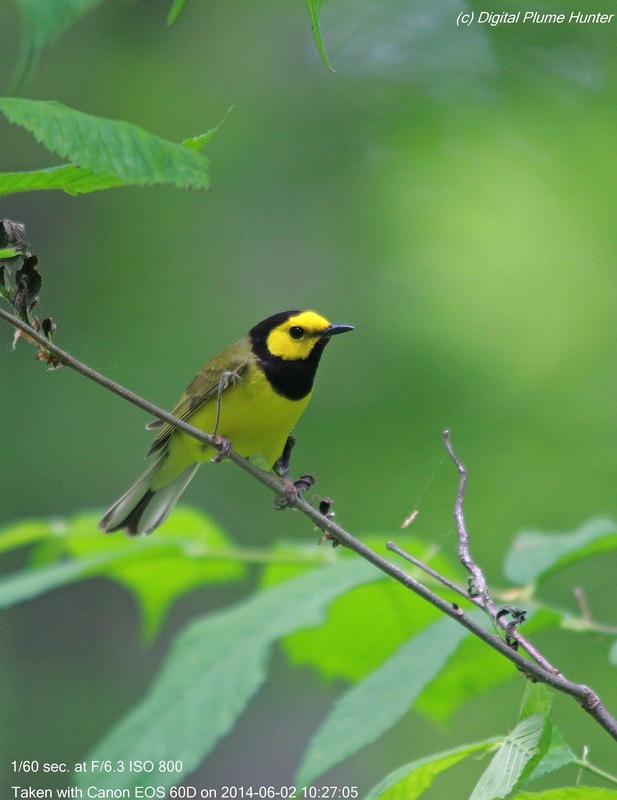 Another thing that the Hooded Warbler has in common with the Mourning is that both species have seen population increases in the US. 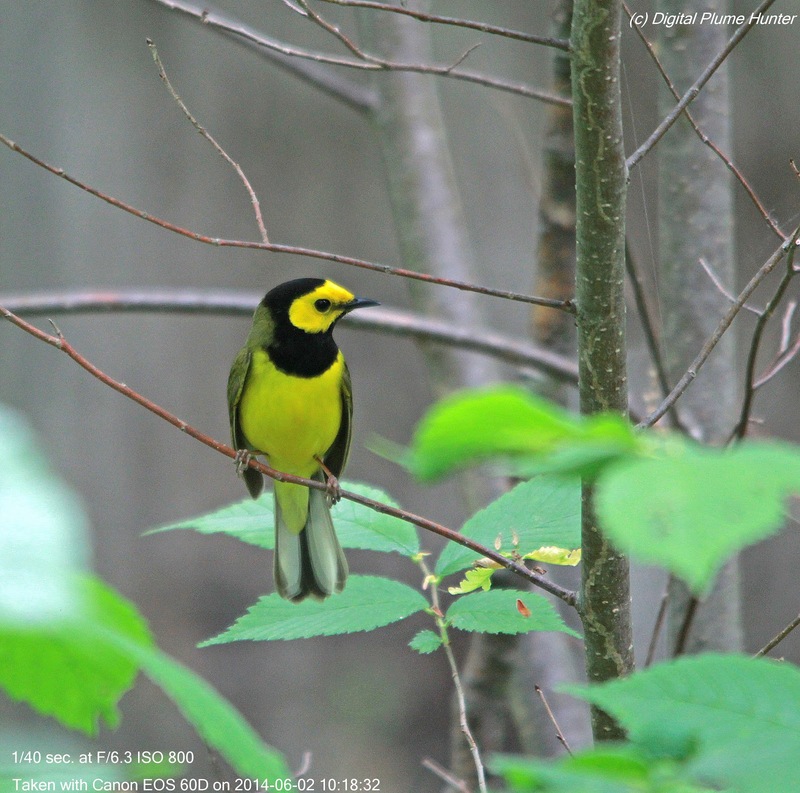 A bright note of hope among the incessant stream of bad news about bird populations in decline. 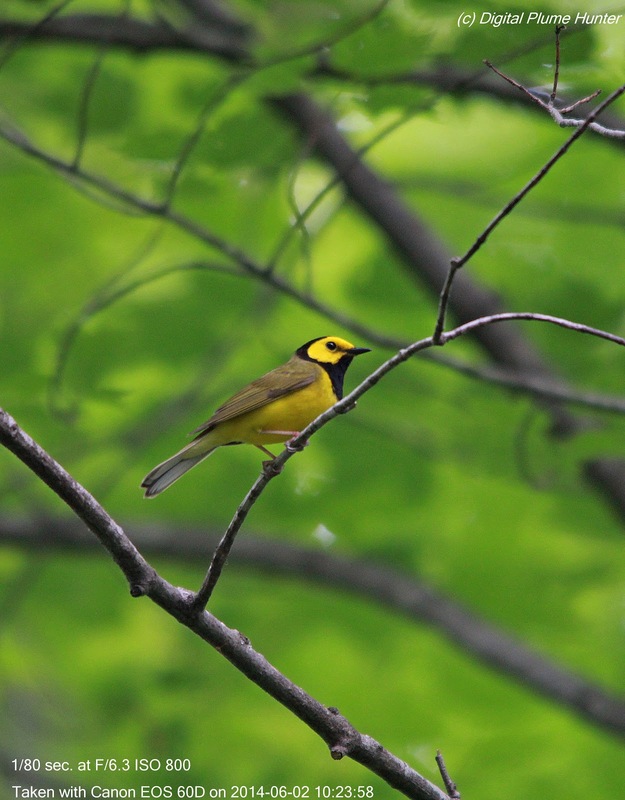 Just where the Blue-winged Warbler was sighted, a Black-and-White was also observed singing. 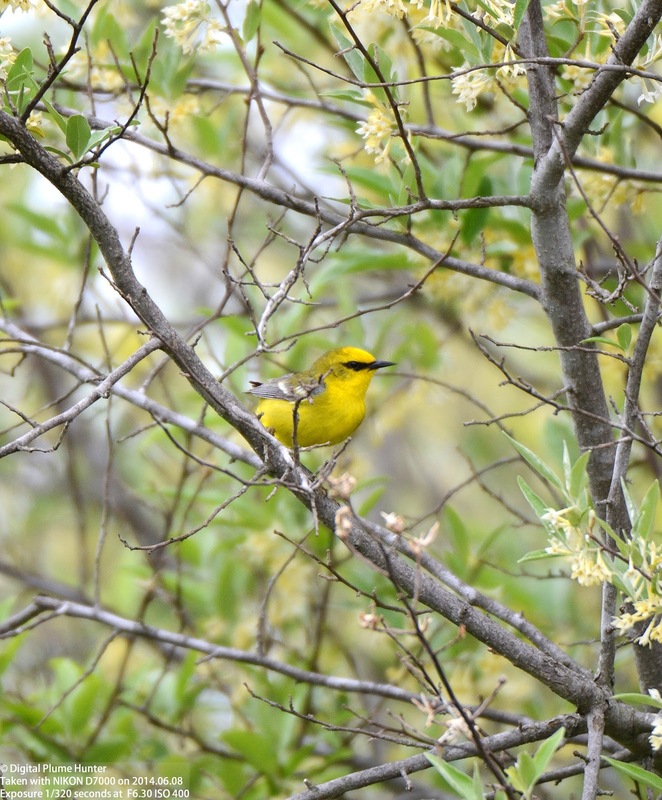 Unfortunately, it didn't stick around long enough to permit a photo opportunity. 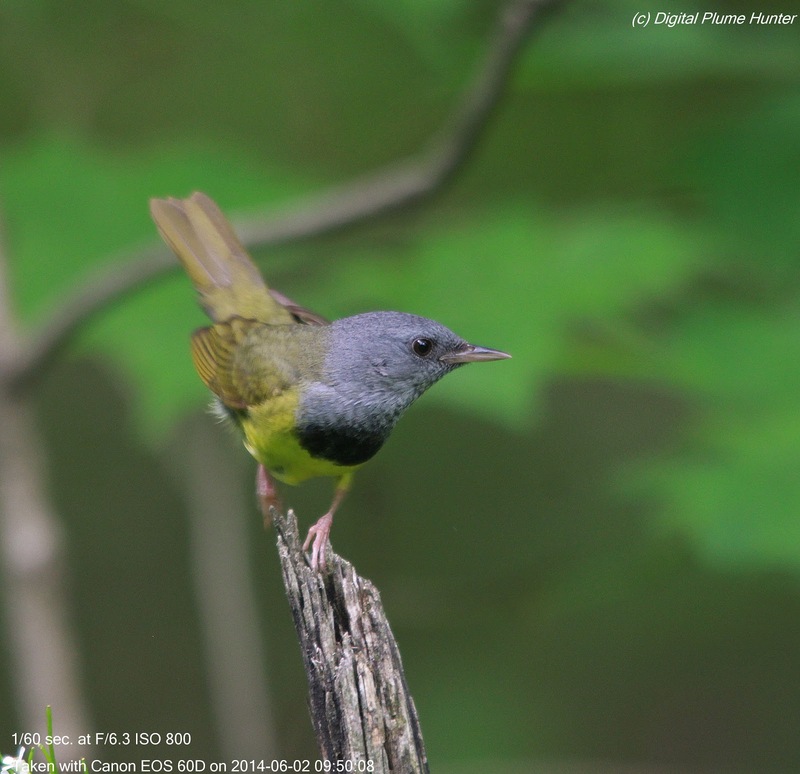 However, given the wealth of other breeding species that were successfully photo-documented, what would otherwise have been cause for regret, barely registered in disappointment. 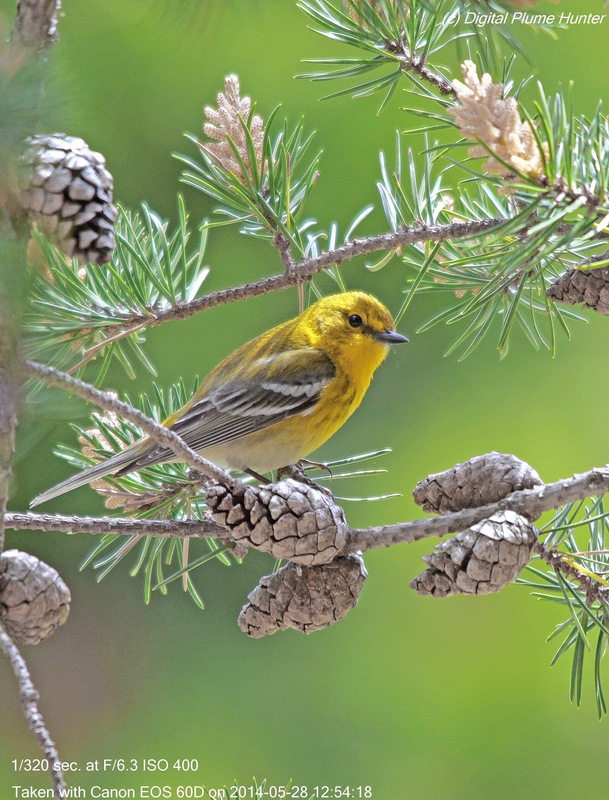 Found year round in the Southeast US, the range of the Pine Warbler extends all the way up to the Northeast American-Canadian border in the Summer. 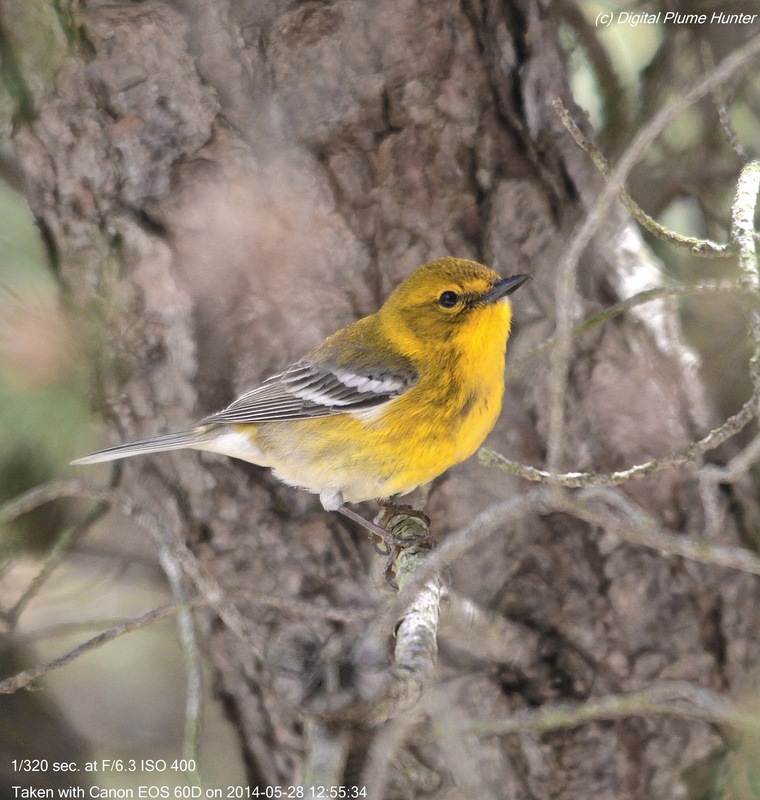 The male Pine Warbler has a bright yellow throat and breast with olive streaking and back. 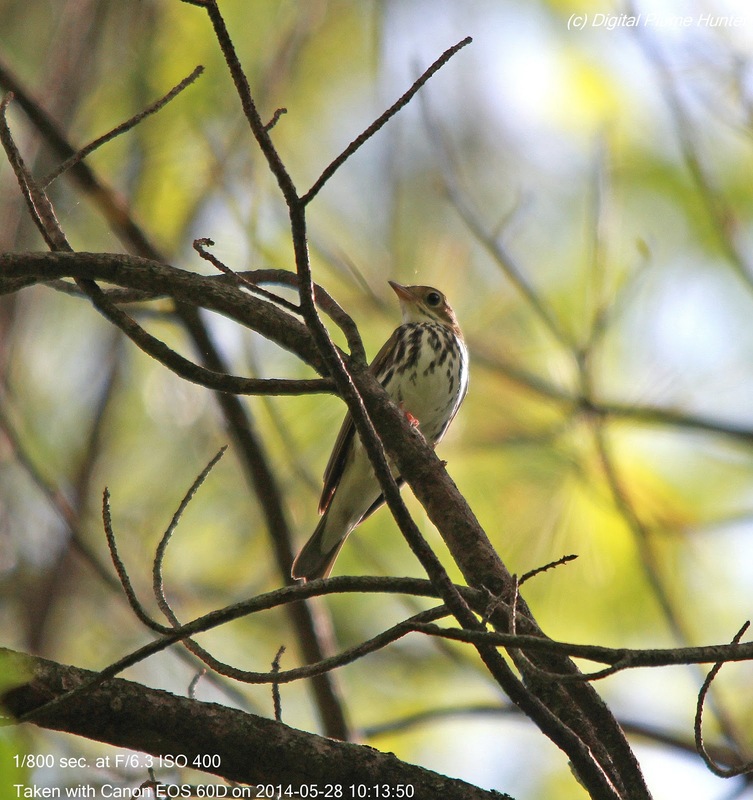 Two white wing bars are prominent on grey wings and white undersides. 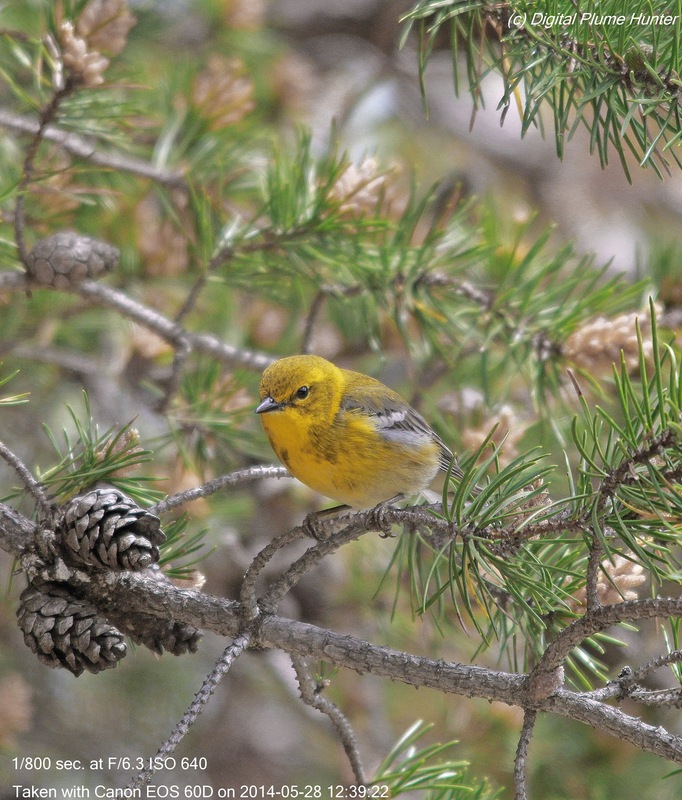 True to its name, this warbler is seldom found away from pine trees. 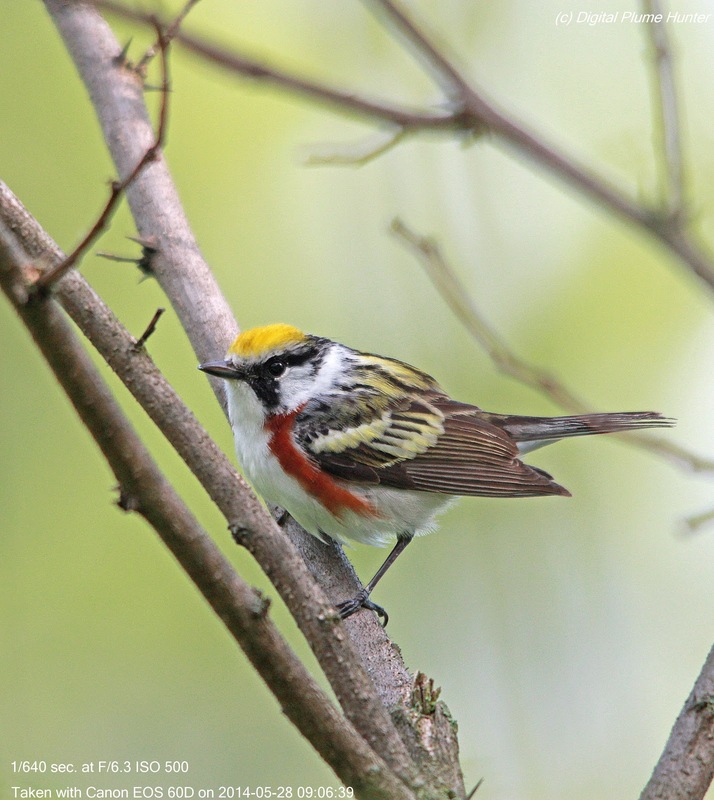 Chestnut-sided Warbler, unlike the Pine Warbler, is strictly a Summer guest in North America -- it retires to the warmer climes of Central and Northern South America in Winter. 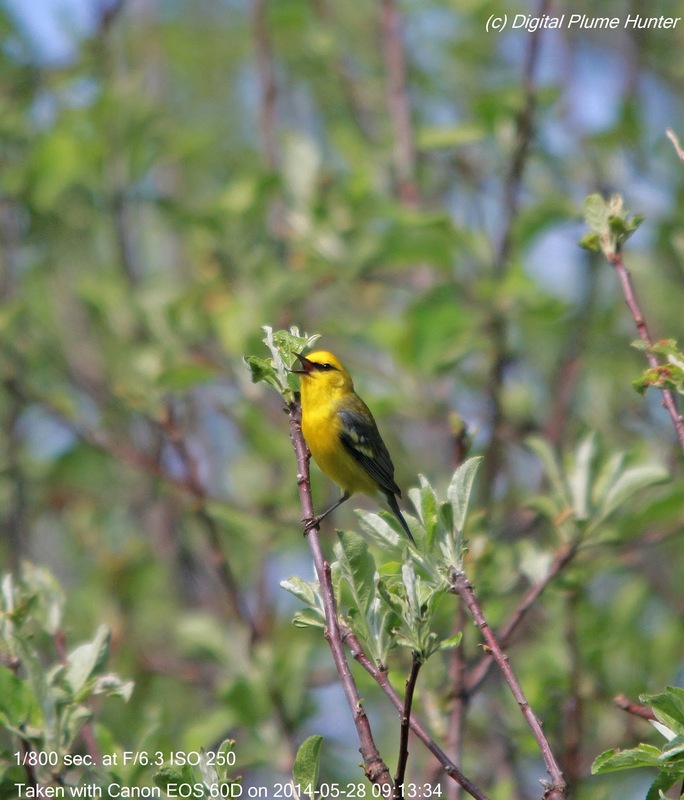 This Mourning Warbler was still on its way to its breeding grounds -- conspicuously perching and singing along the way. 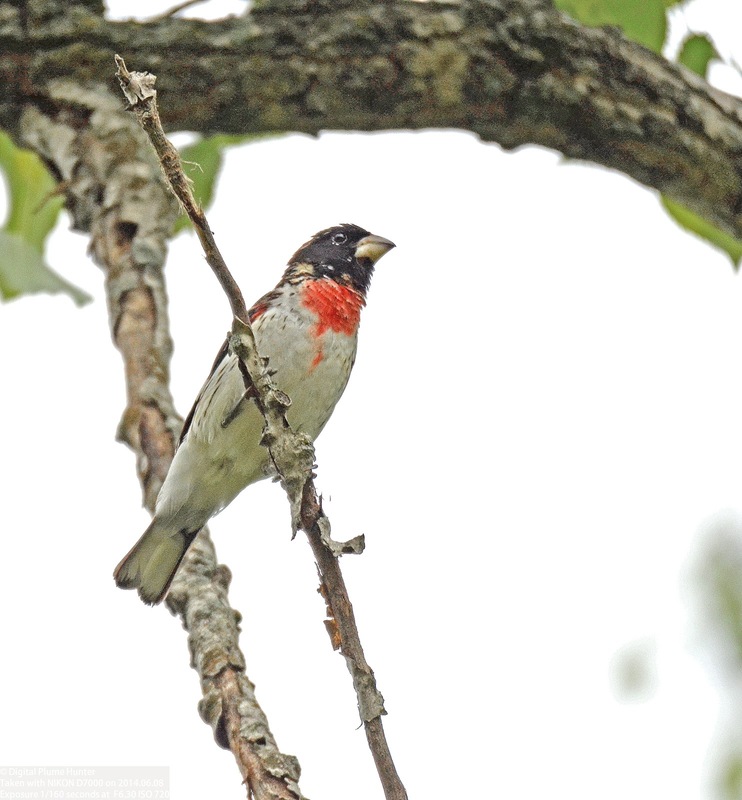 After the magic of migration when birds in passage provide spectacular but fleeting views, it is in the breeding season that loyalty to territory affords the birder predictability in species finding and the luxury of "observation on demand"!